The Ukrainian Orthodox Church of the USA had its beginning in 1918 when several already existing parishes and clergy of other Orthodox and Catholic dioceses decided that the Ukrainian population of the USA had reached the level that this distinctive ethnic identity should have its own jurisdiction. There were many spiritual and political concerns, which inspired this decision and it was immediately successful in terms of the number of parishes and faithful who joined the movement. The group sought and received spiritual protection under the omophorion of Bishop Germanos of the Syrian Orthodox Church in the USA. Bishop Germanos provided the necessary guidance for the fledgling jurisdiction until a petition was sent to the newly independent Autocephalous Orthodox Church in Ukraine, which had formed in October 1921 under the leadership of Metropolitan Vasyl Lypkivskyj following the first declaration of Ukrainian Independence in 1918. The response was the assignment of then Archbishop John (Theodorovich) to care for the spiritual needs of the Ukrainian Orthodox faithful of the United States of America. Archbishop John (Teodorovych). Circa 1925. Archbishop John arrived in the United States in 1924 and immediately called for a Sobor, which would formalize the establishment of the Archdiocese as the American-Ukrainian Orthodox Church of the USA. Bishop Germanos officially relinquished his authority over the Church to Archbishop John. Following the Sobor, under the guidance of Archbishop John, the life of the American-Ukrainian Orthodox Church of the USA truly began to blossom. The Archbishop remained in contact with the Church in Ukraine, but, by 1927 it was clear that the Communist regime would not stop its persecution of this Church, having by that year arrested all its Hierarchs and most of its clergy and destroyed most of the Church properties. By 1937 all the Bishops had been executed and there were no signs of the Church’s life existent. Unfortunately, the Ukrainian Autocephalous Orthodox Church had no opportunity to plead its case for canonical recognition to world Orthodoxy and the decisions and actions of its organizing Sobor have remained controversial to this day. Almost from the moment the 1921 Sobor concluded, the struggle for continued existence was doomed. Archbishop John rejected the claim of the Moscow Patriarchate jurisdiction, which replaced the Autocephalous Church in Ukraine and cut all ties to Ukraine. The American-Ukrainian Orthodox Church of the USA was deeply affected by these facts, in that Archbishop John had been consecrated as one of the first three bishops of the Autocephalous Church in Ukraine and had not received the canonical recognition of world Orthodoxy. In spite of several attempts to plead his case before the Ecumenical Patriarchate no progress was made on the issue and in fact, all his correspondence went unanswered. The clergy and faithful of the American-Ukrainian Orthodox Church of the USA, however, were undaunted in their conviction and their commitment to build their own independent church, which continued to grow and develop spiritually and materially. With the Archdiocesan center located in Philadelphia, a seminary was established and the clergy needed to serve the spiritual needs of the faithful were educated and assigned – all of them working miracles in the establishment and building of new parishes all over the country. Metropolitan John completely immersed himself in the life of our Church and in American society. He became completely fluent in the English language comprehending that his faithful, who had immigrated to the USA beginning in 1880 and between World Wars I and II, had greatly assimilated into their new society. These were Ukrainians who never knew an independent Ukraine or a Ukraine as a political entity to itself. They came from the regions of Ukraine that were occupied continually by neighboring nations like the Austro-Hungarian Empire, Poland and others. The Metropolitan gave them an identity upon which to build their church and he was capable of doing so in a language spoken by all. He was very articulate in English and expressed his deepest theological and pastoral concerns with ease in that language. He was keenly aware of the need to engage the youth of the Church. In 1947, with the leadership of Fr. Volodymyr Bukata and Fr. 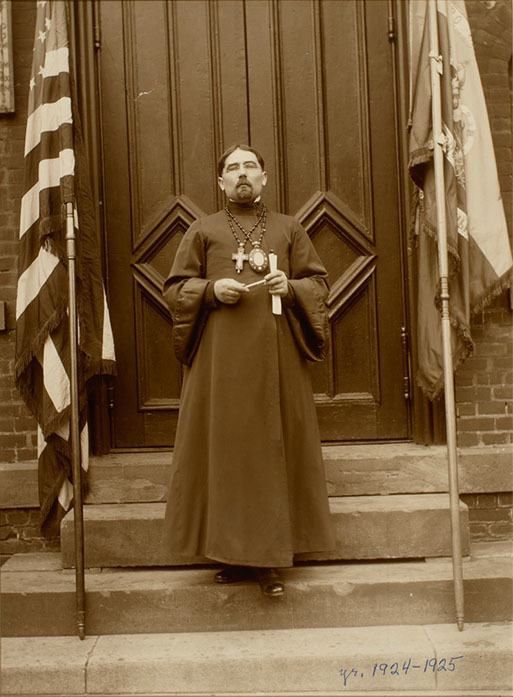 Stephen Hallick-Holutiak, he formed the Ukrainian Orthodox League, the first of our Church Central Organizations. The organization has functioned for 71 years and has been the instigator of many historical developments in the life of the Church – the creation of our own Seminary of St. Sophia, the purchase of All Saints Camp in Emlenton, PA, creation of scholarship programs – the Metropolitan John Scholarship Fund for seminarians and the Lynn Sawchuk-Sharon Kuzbyt scholarship for UOL members who attend college or university, the publication of an abundance of educational materials and ultimately the creation of a Junior Ukrainian Orthodox League of the USA in 1962 to prepare our youth for leadership roles in the life of our Church. In 1928 a second group of Ukrainian Orthodox faithful in the USA initiated a movement toward Orthodoxy. Because of the questions surrounding the status of Archbishop John, the group hesitated in affiliating itself with his already established jurisdiction even though it was thriving. The first Sobor of this group met in Allentown, PA in the spring of 1929 and established itself as the Ukrainian Orthodox Church in America. Rev. Dr. Joseph Zuk was elected as administrator to organize the diocese and at its second Sobor of 1931 in New York City he was elected as its first Bishop. Two hierarchs of the Syrian Orthodox Church in the USA consecrated Bishop Zuk in 1932 at St. Volodymyr Cathedral, on 14th Street in New York City. Unfortunately, Bishop Joseph lived less than two years following his consecration. 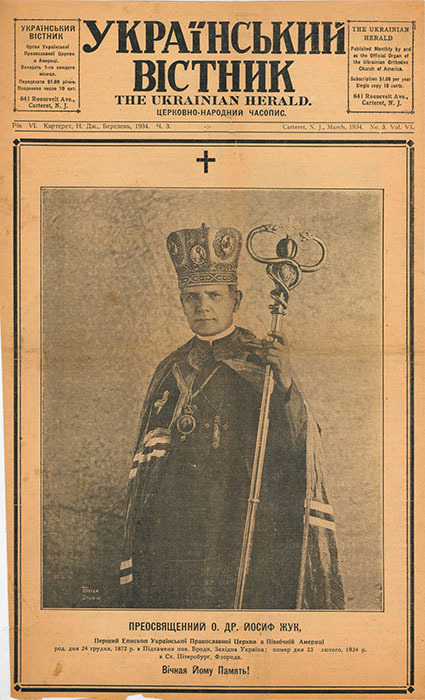 In 1936 the Ecumenical Patriarch accepted the Ukrainian Orthodox Church in America under his omophorion and in 1937 Bishop Bohdan (Spylka) was consecrated as bishop of the diocese. Under his guidance the jurisdiction also began to thrive and the number of parishes and faithful grew, almost rivaling the growth of the American-Ukrainian Orthodox Church of the USA under Archbishop John. The two Ukrainian Orthodox jurisdictions co-existed in the USA for the next 17 years. They both expanded, with Archbishop John also heading the Ukrainian Orthodox Church in Canada and Bishop Bohdan establishing several parishes there, as well. In 1942, the Ukrainian Orthodox Church in Ukraine was re-born once again as part of the Autocephalous Orthodox Church of Poland headed by Metropolitan Dionisij (Valedynskyj) during a brief relaxation of religious persecution by the German occupation of Ukraine. One of the bishops consecrated for the resurrected church in 1942 in Kyiv was Bishop Mstyslav (Skrypnyk), who eventually came to Canada to lead the Ukrainian Orthodox Church there, taking over from Archbishop John. Bishop Mstyslav left Canada within a few years and came to the United States to join the jurisdiction of Bishop Bohdan, with the approval of the Ecumenical Patriarchate. He had a great desire to unite the two existing jurisdictions in the USA. Bishop Mstyslav, who was a validly consecrated bishop, persuaded Archbishop John to submit to a new consecration in order to resolve all canonical questions about his Episcopal status and as prerequisite of unification of the two churches. In 1949 Archbishop John agreed and was consecrated by Bishop Mstyslav and Metropolitan Christopher, Exarch to the USA of the Alexandrian Patriarchate. Proceedings of the Unification Sobor. 1950. We can only imagine the immense joy felt by the participants of this joint Sobor at hearing these words and what they envisioned to come in the life of their Holy Ukrainian Orthodox Church. It was a joy that resounded throughout the world and over the next two decades, many more parishes joined the united Church and still more were founded by recently arrived immigrants from the Displaced Persons camps in Germany. Even though he had decided to remain outside the newly united Church, Bishop Bohdan did attend the unification Liturgy to witness the event. Work began in earnest on the next day with the Consistory, headed by Archbishop Mstyslav, working diligently to bring more and more of the Ukrainian Orthodox faithful in the USA into the Church. The Metropolitan Council met frequently in those first months to make the decisions necessary for building a solid base for organized life in the Church. 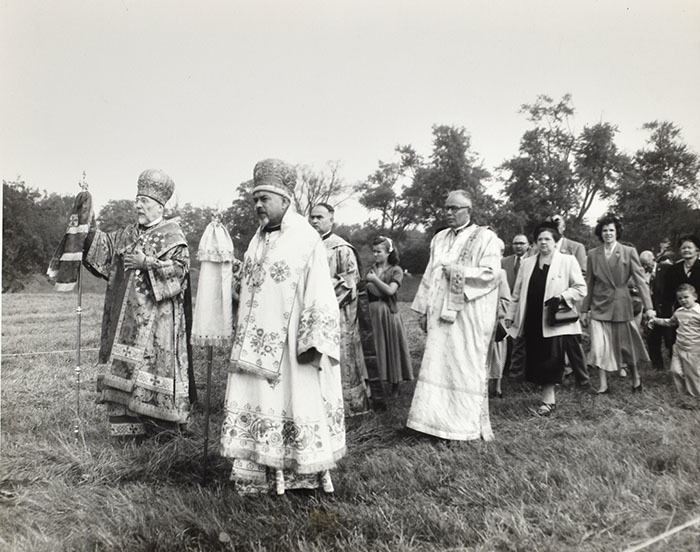 At the June 1951 meeting of the Council, a proposal was presented to purchase a 57-acre farm in Central New Jersey, not far from the Ukrainian Village, a summer residence and social center of St. Volodymyr Cathedral, New York City. Protopresbyter Lev Weselovsky was the pastor of the Cathedral who convinced our Hierarchs to consider the proposal and give their support to it. The farm was originally the estate of New Jersey’s delegate to the United States Continental Congress – Heindrick Fisher. The proposal to the Metropolitan Council stressed the historical connection to American history and that the topography of the property, along with the buildings thereon, all lent to a most appropriate location for the Administrative Center and National Headquarters of the Ukrainian Orthodox Church of the USA. In 1951, the Episcopacy of the Church was enlarged upon the arrival and acceptance of Bishop Volodymyr (Malets), who was assigned to Pokrova Parish in Detroit. In 1957 he was elevated to the rank of Archbishop serving another 20 years until his untimely repose in the Lord at the age of 77 in July 1967. Archbishop Volodymyr was a well educated theologian having studied at the Kiev Theological Academy in Ukraine and teaching in his eparchy as the Bishop of Cherkassy following his consecration in 1944 under the authority of Metropolitan Dionisij of Warsaw. He emigrated to the to West with the majority of the hierarchs of the Ukrainian Autocephalous Orthodox Church in 1944, first to Warsaw and then to the Displace Persons camps in Germany where he continued to serve on the Synod of Bishops for the Church until his departure to the Ukrainian Orthodox Church of the USA in 1951. The Archbishop loved to write and contributed monthly to our Church publications like the Ukrainian Orthodox Word. Clergy who spoke at his funeral expressed their eternal gratitude to him for enabling their continued education through his writings in many areas of theology and liturgical service. When one reads the minutes of that 1951 Metropolitan Council meeting, the enthusiasm for the proposal almost jumps off the pages and immediately both clergy and lay members make their pledges toward the purchase price of $90,000 – an enormous sum for the time: Frs. Lev Weselovsky, Demetrius D. Leschishin, Ivan (later Archbishop Mark) Hundiak and Mykola Kashuba all pledged loans of $500. Outright gifts were pledged by: Archbishop Mstyslav for $200, Fr. Weselovsky (in addition to his pledge to loan $500) another $500, Council Member Oleksij Heleliuk $250, Hryhorij Pypiuk, Fr. Ivan Hundiak, Fr. Andrew Beck, Fr. Mykola Kashuba each gave $50 and Prof. Vasyl Zavitnevych - $25. A total of $3,125 gifted in just a few minutes – this was an enormous sum of money for the day. After such an expression of enthusiasm, needless to say, the proposal was approved unanimously. “With the Proclamation of 15 October 1950, in which the Sobor of our Church called into being the Ukrainian Orthodox Church of the USA…uniting all those who not by word, but by deed, gave evidence to their devotion to our Heavenly Father, all those who honorably thirst to serve God and the ill-fated Ukrainian nation. The united Ukrainian Orthodox Church of the USA has become a treasury of immense value, at one of great importance to Ukraine and to the United States of America. “We are, however, only free to praise ourselves and fully rejoice at this great and monumental event in our life, when with equal measurement, we are aware of the obligations placed on our shoulders by our Lord in blessing our Church unity. We can never forget that our united Ukrainian Orthodox Church of the USA is called by God to the fulfillment of great tasks – reaching out to the forsaken, the addition of new spiritual qualities, the return to the Church of our brothers who have abandoned God and nation, leading our children along the path of Christian life – among others. In all this, the Lord is testing us, but as a Good Father, He has equipped us for this test. He has united us and made us stronger as a result! In our hands today are those Gospel ten talents, which we must multiply and not simply bury or completely waste. The appeal was a success and the consecration of these holy grounds was scheduled for 1 June 1952. A three-day long summer rainstorm, however, prohibited the actual consecration from taking place. In spite of the rain, over 2,500 people arrived, surprising, but at the same time morally uplifting the organizers of the event. The whole program, including Divine Liturgy, was moved to the auditorium of the local high school, which held only 1,200 people, so all the hallways and some classrooms were filled with faithful. Some even had to remain in their cars or buses. Over 30 priests, five deacons and 30 altar boys served with Metropolitan John and Archbishops Mstyslav and Hennadij, while the choir from St. Volodymyr Cathedral in New York City, enhanced by singers from parish choirs of Carteret and Newark, NJ. During Divine Liturgy all three bishops spoke. Metropolitan John spoke of the great role played by Ukrainian Orthodox religious centers in the life of our Ukrainian nation – like Pecherska Lavra (the Monastery of the Caves) in Kyiv. He reminded everyone of the great responsibility placed before us by God in this center founded only seven months earlier. Archbishop Mstyslav pointed to the continued growth of the Ukrainian Orthodox Church of the USA since the Sobor of Unification in 1950, especially with the recent founding of many parishes by recent arrivals from Europe. In concluding his talk, the Archbishop – always looking ahead – called upon all the faithful to contribute to the building fund of the Memorial Church, which would be built on the South Bound Brook property – in remembrance of those millions who gave their lives for the independence of both Ukraine and the United States of America. Metropolitan John, Archbishop Mstyslav, clergy and faithful at the consecration of the grounds of the Metropolia Center. 1952. 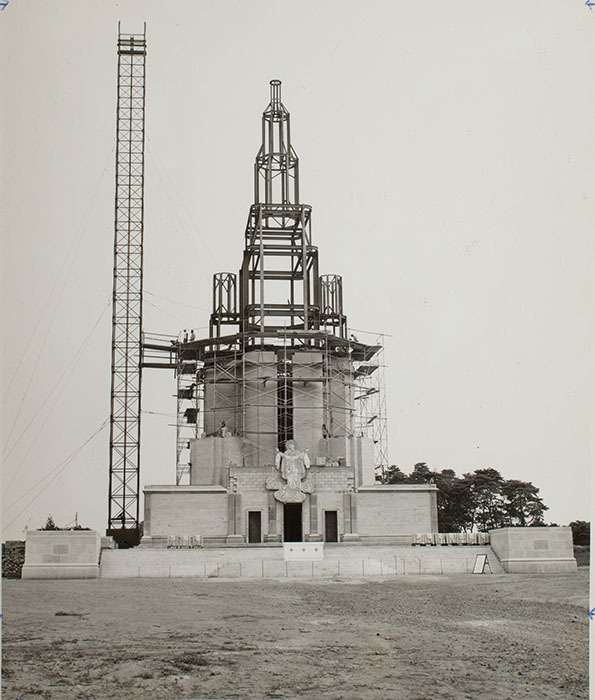 The actual consecration of the center property, along with the residences, the newly established library and archive, and the print shop, were blessed in rescheduled ceremonies on 21 September 1952 – the Feast of the Nativity of the Mother of God. 1,500 people participated in this celebration and had the opportunity to walk through the entire property, especially approaching the location of the temporary altar, which stood on the spot where our Memorial Church stands today. Behind the altar was the beautifully crafted icon of the Mother of God. Metropolitan John and Archbishop Mstyslav concelebrated Divine Liturgy. It was a gloriously beautiful day on which that originally scheduled cultural concert took place. Fifty-six priests participated in the event, which immediately followed the first ever clergy conference of the Ukrainian Orthodox Church of the USA following the Unification Sobor. On that late summer day – 21 September 1952 – the only buildings existent at our Church Center under the protection of St. Andrew the First-called Apostle were the Fisher Family Home, which had become the Consistory and residence of the Archbishop, the print shop from which emanated the “Ukrainian Orthodox Word”, a small home where the Consistory Treasurer lived, and the mill, which served as a community center, library/archive, and a school of Ukrainian and religious studies. Through the years much has been added to these hallowed grounds. Many changes and additions to our property have taken place. View of St. Andrew Cemetery from the top of St. Andrew Memorial Church. 1960s. 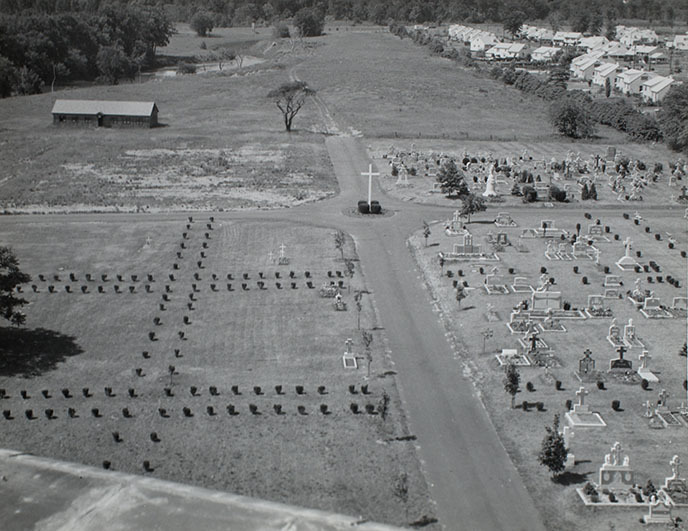 In 1954, Franklin Township authorities granted permission for the establishment of our St. Andrew Cemetery on 15 original acres of the property. This was made possible only because the Fisher family cemetery was already located on our property and is still maintained by our Church as a historical site. The cemetery was consecrated on 26 September 1954. Interments began almost immediately and the cemetery has grown to nearly 15,000 graves covering 25 acres of land, including the extension granted on the property near the Seminary and Consistory. Laying brick around the steel frame of St. Andrew Memorial Church. Late 1950s. “The Memorial Church – this is the combined monument over the graves of our forefathers – those related to us and most dear to us. The Memorial Church – this is the expression of our deep respect for the heroes and martyrs of our Ukrainian nation. The Memorial Church – this is the very humble cross over the graves of millions of victims of the genocidal famine ploughed over by the enemy. The Memorial Church – this is our feeble attempt to recreate the majesty of the Ukrainian churches destroyed by the Moscow communists in just the 20th century. The Memorial Church – this is the creation of the free Ukrainian spirit, inseparably joined to the ancient Ukrainian style of Church construction. The Memorial Church – this is our humble contribution to the treasury of spiritual and cultural wealth of the United States of America. We can add that the Memorial Church, more than anything else, has become the symbol of our Ukrainian Orthodox Church of the USA and our Church Center – the Ukrainian Jerusalem, as Archbishop/Metropolitan/Patriarch Mstyslav so fondly called it. In 1952, a library was established in the building – the gristmill of the Fisher family, which also housed our first Church of St. Andrew. The library was created to preserve the Ukrainian historical, theological, cultural, literatary, among other types of books that were systematically being destroyed by the Soviet regime in Ukraine. Unfortunately, this Church building and social hall beneath were destroyed by fire in 1964. The library was, however, saved and transferred later into the basement of the newly completed St. Andrew Memorial Church. Following the completion of the Ukrainian Cultural Center, the library was moved in the early 1980’s to the Center and combined with the rapidly growing St. Sophia Seminary Library, which had outgrown its space in the Seminary building. In 1988 the new Consistory Administrative building was completed on the 1000th Anniversary – the Millennium of the Baptism of Ukraine into Holy Orthodoxy and a special library wing was included into which the combined library was moved as a permanent home. In the mid 1950’s our Episcopacy was increased with the arrival of Archbishop Volodymyr (Malets) from Europe, who was received by Metropolitan John and Archbishop Mstyslav and assigned to the Cathedral of the Protection of the Mother of God in Detroit, MI. His Eminence developed Ukrainian Orthodox community life in the entire Midwest area where our church had no real episcopal authority present. 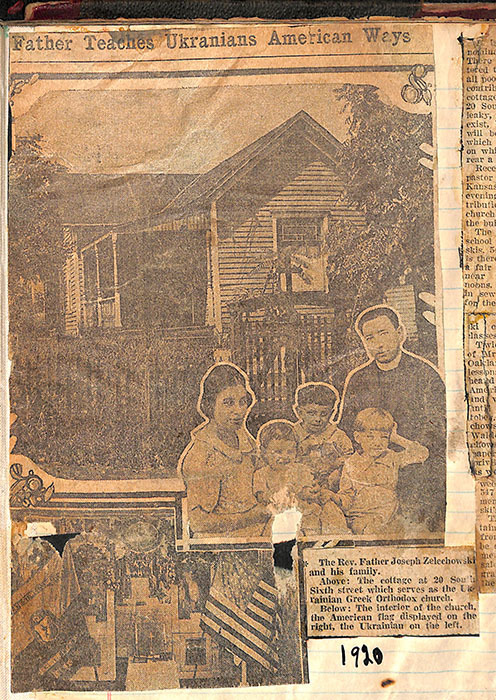 In 1960, progress had an effect on our Church life, when the Federal Government began construction of the Interstate highway system and took away from our property four acres of land for the actual highway and separated from the main portion of our property another 18 acres of land on the other side of the highway. We were paid $21,600 for the four acres, which was over 5 times what we paid for the property in 1951. We received many offers for the 18 acres on the “other side of the road” through the years, but with good foresight, Archbishop Mstyslav refused to sell, calling this land our assurance policy for the future. 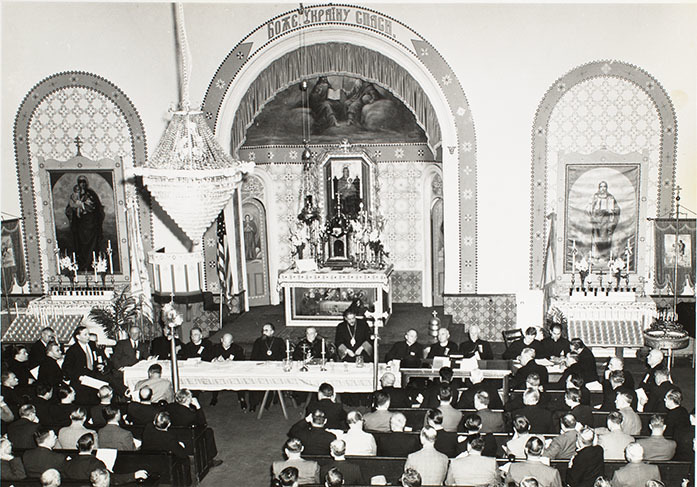 Our Church was blessed again in 1961 when Metropolitan John and Archbishop Mstyslav blessed the creation of a new central organization in the United Ukrainian Orthodox Sisterhoods. It was a body that represented all the sisterhoods in our parishes around the country. 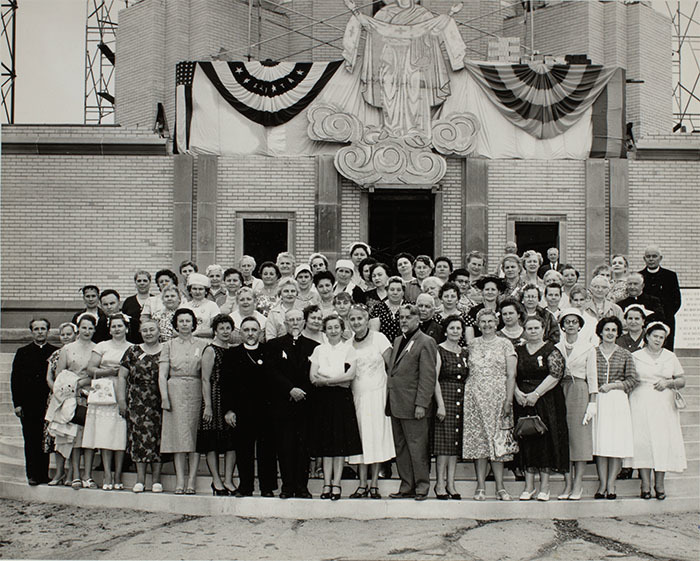 Membership in the body was voluntary on the part of the parish sisterhoods and at its peak had 46 sisterhoods participating. 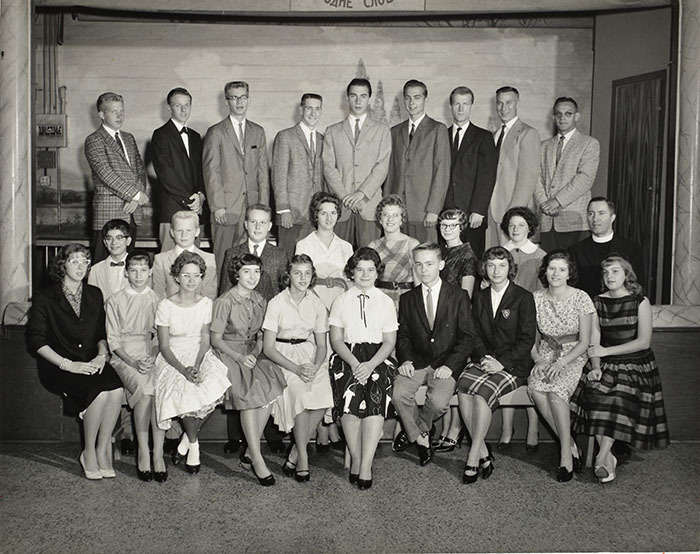 There was a central Executive Board elected at the general meeting of the United Sisterhoods, which were held every three years after the first organizational meeting in 1961. This organization’s activities far outsized the number of people serving on the Executive at any given time. The UUOS published an “English Encyclopedia of Ukraine for Children” among other publications, including its monthly magazine “Vira” (“Faith”). A very successful scholarship program for over 50 years offered financial aide to students – members of our Church in the USA, South America and in independent Ukraine. For the last 15 years the organization has contributed tens of thousands of dollars to the Museum construction fund and will sponsor the permanent exhibit about the Holodomor in Ukraine. Unfortunately, the UUOS is no longer active due to a financial crisis created by the actions of its treasurer, after which the organization was unable to recover or redefine itself. 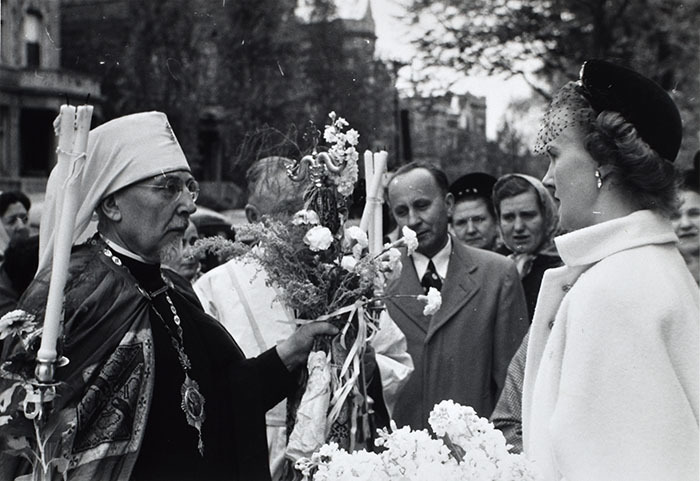 In 1962, Archbishop Hennadij following disagreements with his brother hierarchs, chose to leave the Ukrainian Orthodox Church of the USA with his Cathedral of Holy Trinity. Two years later he was received with his parish into the Ukrainian Orthodox Church in America under the Ecumenical Patriarchate where he remained until his repose in the Lord in 1973. In 1967 Bishop Alexander (Nowitsky) was consecrated as Bishop of Chicago. He, unfortunately served for only three years because of his untimely death in 1970. Bishop Alexander was a strong support of Metropolitan John’s vision for the Ukrainian Orthodox Church of the USA. He also comprehended the necessity of working diligently with the youth of our Church with the goal of retaining their dedication and devotion to Christ through our Holy Church. Parishioners greeting Metropolitan John during a parish visitation. Undated, likely 1950s. In 1970 Bishop Mark, the former Fr. John Hundiak and long-time pastor of St. Demetrius Parish in Carteret, NJ, was consecrated as an auxiliary bishop to the Eastern Eparchy under Archbishop Mstyslav. He was elevated to the rank of Archbishop in 1971, and remained at St. Demetrius, which was elevated to a Cathedral, where he served for over 52 years as pastor until his repose in the Lord in July of 1984. The Archbishop worked closely with the Ukrainian Orthodox League and was one of the very first priests serving in our Holy Church since its foundation in 1918. 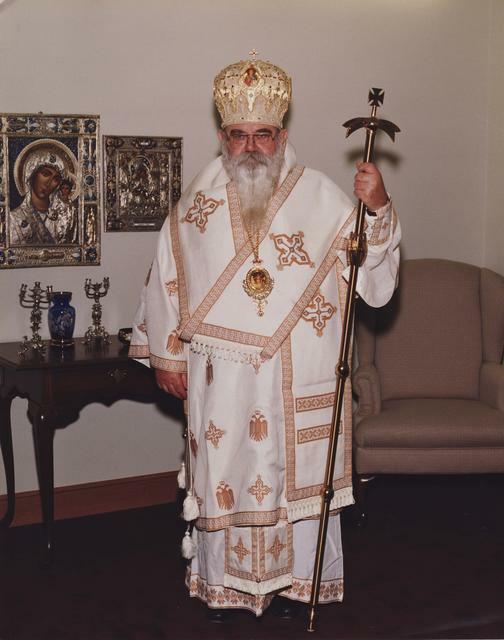 A great tragedy struck the life of our Church in May of 1971 with the repose of His Beatitude Metropolitan John Theodorovich, our prime hierarch from 1924 through 1971 – 47 years of love and closeness to the children of the church. When he visited our parishes the children flocked to him because of his obvious love for them and he told them all to call him “Grandpa”, which many to this day fondly remember. The Metropolitan continually strived to maintain the unity of the Church when faced with discord between the various waves of immigration that made up the laity and clergy of the Church. He strove to be a pastoral bishop to his flock, a capable administrator and a true academic, theologian, philosopher and teacher. He organized our first seminary around 1940 in his Cathedral in Philadelphia, where he personally oversaw the education of the first American born students of our Church, whom he later ordained to the Holy Priesthood – among them Frs. Frank Lawryk, Stephen Hankevich, Stephen Hallick-Holutiak. Metropolitan John oversaw the purchase and development of the Metropolia Center from 1952 until his repose in the Lord. He was prolific writer and served as a true pastoral example to his clergy throughout the Church. The Metropolitan did not permit the unending questions about his episcopal consecration to deter him from his true and devoted service to our Lord. He simply trusted that God would be the Judge about whether or not he was “canonical”. The Metropolitan was laid to rest in St. Andrew Cemetery just behind the Memorial Church at the Metropolia Center. Following the repose of Metropolitan John in 1971, Archbishop Mstyslav was elected as our Church’s Metropolitan and assumed the responsibilities of the office later that year. He had already served our Holy Church as Archbishop and President of the Consistory for 21 years which were now to be followed by another 22 years as Metropolitan until his repose in the Lord in 1993 at the age of 95. It is difficult to even begin to describe the talents and abilities of this man who lived his entire life in service to the Ukrainian nation and the Holy Ukrainian Orthodox Church. He served as a Lt. Colonel in the government of his uncle Symon Petlura and from there served as a representative of the Volyn Region of Ukraine (at that time part of Poland) in the Polish Parliament representing the Ukrainian people in the territory. He became very involved in the life of the Church and was selected during the German occupation of Ukraine to be consecrated as a Bishop of the Autocephalous Church under the spiritual authority of Metropolitan Dionisij of Warsaw, being consecrated at St. Andrew Cathedral in Kyiv, as were a number of other bishops at the same time period to serve the swelling ranks of the reborn Ukrainian Autocephalous Church. When the communists made their final and major drive to take over all of Ukraine, Bishop Mstyslav and the majority of the other hierarchs of the Church were forced to follow the retreating Germans to the West. He remained in Germany as part of the Holy Synod of Bishops reorganized there under the leadership of Metropolitan Policarp (Sikorsky). In 1948 he emigrated to Canada to serve the Ukrainian Greek Orthodox Church there. Due to various conflicts, he decided to move to the USA where he was accepted into the Ukrainian Orthodox Church in America headed by Bishop Bohdan (Spilka). As stated earlier in this document, he was the driving force for the re-consecration of Metropolitan John and for the unification of the two Ukrainian Orthodox jurisdictions into the Ukrainian Orthodox Church of the USA. When this united Church purchased the property in South Bound Brook, NJ, which later became our Metropolia Center, both Metropolitan John and Archbishop Mstyslav put their abundant talents to work in bringing all our parishes, clergy and faithful to one mind and purpose of building the Center into a Ukrainian Orthodox spiritual home, which rivaled such in Ukraine. He was a very capable administrator and put all his energy into the construction of the complex we know today. He did not consider himself to be a theologian, but rather a historian gifted with the ability to remember the lessons of history and utilize those lessons to convince the Church about the path into the future. He never, ever gave up hope that he would see in his lifetime an independent Ukraine and the rebirth of the Ukrainian Orthodox Church. He consistently declared that we must always be ready for when that day comes and that we must do everything to preserve the legacy of our Faith and our Nation for those who suffered so long and horrifically under the Soviet regime. He never failed to condemn the Soviet actions throughout the regime’s existence and to demand from the rest of the world – including sitting in the Cabinet room of the White House with Ronald Reagan “instructing” him how to handle his first summit meeting with Russian leader Gorbachev. Metropolitan Mstyslav being carried into the Church of the Elevation of the Holy Cross in Ternopil, Ukraine. November 7, 1990. The Metropolitan’s vulnerability in his leadership of our Ukrainian Orthodox Church of the USA was that he never understood the two waves of Ukrainian immigration who built our Church on a solid foundation for 35 years prior to his arrival in the USA. These two waves of immigration had long ago assimilated deeply into the American society and having never experienced the suppression and repression of the Soviet regime against Ukraine and at times failed to comprehend the experience of those who did experience that suppression and repression. The Metropolitan was continually frustrated when confronted with the differences and sometimes conflicts between these waves of immigration and the third wave – of which he was a part. Regardless of this, when he met with and spoke publically to any wave of immigration, he was an inspiring presence with great charisma who could make the reality of what was happening to the Ukrainian people and nation. After Ukrainian independence was achieved and the Church there reborn – the third time for the Autocephalous Church – he was astounded when informed that he was elected as the first Patriarch of that Church. He became the symbolic tie between pre- and post- Communist Ukraine. A powerful symbol with a powerful voice – even at the age of 92 when he returned to Ukraine for the first time since 1944 as a hero who believed that the Church must be the moral conscience of the nation. Construction of the Ukrainian Cultural Center. 1979. 7 May 1972 was another historical day in the life of the Ukrainian Orthodox Church of the USA when the first American-born Bishop for the Church in the person of the former priest, Fr. Theodore Buggan, who took the monastic name of Constantine, was consecrated in St. Vladimir Cathedral, Philadelphia, PA. It was an enormous step in the life of our Church, which proved to be most positive when the young Bishop Constantine won the hearts and love of those who had resisted the idea of electing a third generation American Ukrainian as bishop. His Grace, Bishop Constantine, became the Bishop of Chicago and found himself once again united with his life-long mentor, Protopresbyter Theodore Bilecky, but now as Fr. Theodore’s superior. The Bishop set out to build the Chicago See and to unite all Ukrainian Orthodox Christians in true commitment to our Lord and faithful in their desire to not only preserve our specific Ukrainian Orthodox spirituality, but to enhance it and pass it on intact to successive generations. The Bishop’s work was not confined to the Chicago area. He visited parishes throughout the USA, Europe, Australia and South America representing our church well and encouraging the faithful in all places – always concentrating on the youth and their role in the future of the Church. The Bishop served on commissions to establish our own Seminary of St. Sophia in 1975 and a leading supporter of the Ukrainian Orthodox League effort to purchase what would become All Saints Camp in 1977. He served as Rector of St. Sophia Seminary for 25 years and as Spiritual Father to the Ukrainian Orthodox League for 35 years. The Bishop Constantine was elevated to Archbishop in 1986. He, in following the example set by Metropolitan John, was especially devoted to the youth of our Church participating in the encampments of the youth at All Saints Camp every year. 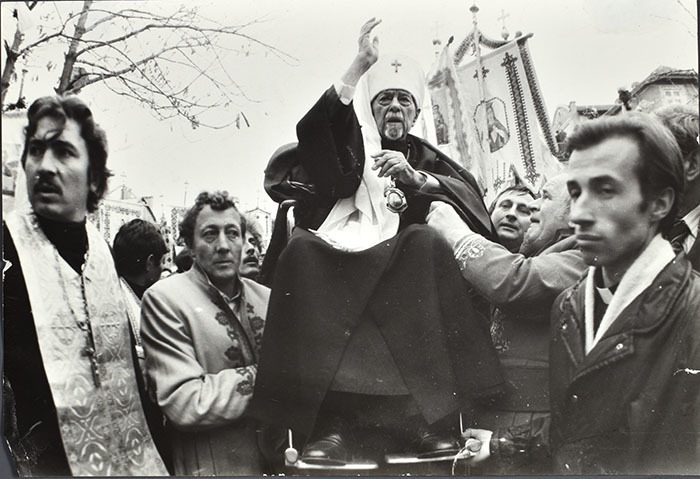 Following the downfall of the Soviet Union and the independence of Ukraine, the Archbishop made several visits to Ukraine attempting to promote the unity of the Church there. Patriarch of Ukraine and Metropolitan of our Church here in the USA, Mstyslav nominated Archbishop Constantine during the Sobor of 1992 for elevation to the rank of Metropolitan, which the Sobor confirmed. In 1993, following the repose of Metropolitan Mstyslav, Metropolitan was elected Prime Hierarch of our Church where he served for 19 years until his own repose in May of 2012. An important contribution of Metropolitan Constantine was the bridging of the gap between the third wave of immigrants and those that preceded it. The fear of having and American-born hierarch quickly faded when it was obvious by his words and deeds that he fully comprehended the mindsets and experiences of all the faithful entrusted to him by our Lord. In 1972 God provided us with basically another gift. The Heatherington Estate – the family that founded the New York Stock Exchange – just across the pond from our original property was offered to us for purchase. It was the wish of the family that our Church have the first opportunity to purchase the property. By the Grace of God, our faithful were encouraged to offer their support with outright gifts and loans, to make this purchase possible. Fifty acres of land were received in this transaction at $50,000 per acre and there was much doubt from all sides about whether or not we would be able to pay the debt incurred. Again, the finger of the Lord intervened and a building developer came forward with a proposition to purchase 15 acres of land on the back of this new property, right along Interstate 287. The income realized from the sale of this land and the abundant contributions from our parishes and faithful were sufficient to pay for the new property. In 1975 the main building on the Heatherington Estate – the family mansion – underwent a complete renovation and was converted into St. Sophia Ukrainian Orthodox Theological Seminary. The doors to this venerable institution opened for the first academic year in September of this year and nearly one half of our current clergy received part or all of their theological and pastoral education there. The Seminary has steadily grown in its capacity and programs and in 2015 it was licensed by the State of New Jersey as a graduate educational institution with the right to award the Master of Divinity Degree. The Board of Trustees and staff are presently in the process of applying for accreditation through the American Theological Schools Association, the first step of which is candidate status. In addition to the late vocations program and the relatively few American born students applying for the full seminary program, the student body has grown with applicants received from Ukraine. The United States Department of Homeland Security “SEVIS” program has officially recognized the Seminary by as a valid institution for the acceptance of foreign students. The Seminary has completed its 42rd of continuous successful operation in May 2018. On 14 September 1980 the Ukrainian Cultural Center was blessed and occupied for the first time after a very long construction and certificate of occupancy process. It is dedicated to the Millennium of Orthodox Christianity in Ukraine and is a memorial to all the churches, libraries and archives destroyed during the communist regime in the 20th century. It has served throughout its existence as a center for Ukrainian Arts, education – our School of Ukrainian and Religious Studies, social and cultural activity for the Ukrainian community of New York and New Jersey and for all activities of our Church. Most recently it also became the temporary repository and exhibition site of our Church Museum in anticipation of the completion of construction of our new History and Education Center Museum. Our Church Archives are also housed in the Cultural Center. It has been a source of continued financial support for the maintenance of our entire Metropolia Center for 38 years. Monument to Metropolitan Vasyl’ Lypkivs’kyi with sculptor Petro Kapschutschenko. 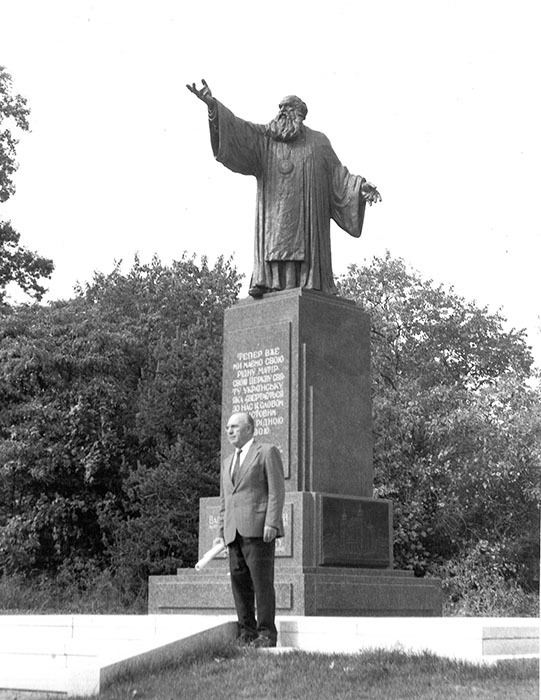 In 1983 on 23 October the impressive monument to Metropolitan Vasyl Lypkivskyj unveiled and blessed. The Metropolitan is a martyr for our Holy Ukrainian Orthodox Church and without the courage he displayed, however it might be judged by others, it is most likely that our church here in the USA would not be in existence today. He awakened the consciousness of the faithful about their Ukrainian Orthodox Faith and the spiritual legacy handed down to them by their forefathers – the saints and martyrs who gave their life’s blood in protection of that legacy. At the regular Church Sobor in 1981, the Council of Bishops presented the candidacy of Fr. John Scharba for election as the second American-born Bishop of our Holy Church. He was tonsured a monastic in 1983 with the name Antony – after St. Antony the Great whose feast day is on the birthday of the candidate. In 1985, Bishop Antony was consecrated in St. Andrew Memorial Church at the Metropolia Center. He was immediately assigned as Provost of St. Sophia Seminary and Editor of the English version of the Ukrainian Orthodox Word. In the Fall of 1985 he was asked by Metropolitan Mstyslav to travel to the parishes seeking assistance for the legal defense fund for one of our parishioners, Mr. John Demjanjuk. The Archbishop remained involved in the defense of Mr. Demjanjuk for over 20 years through the overturning of his guilty verdict in Israel until his death in a nursing home in Germany. 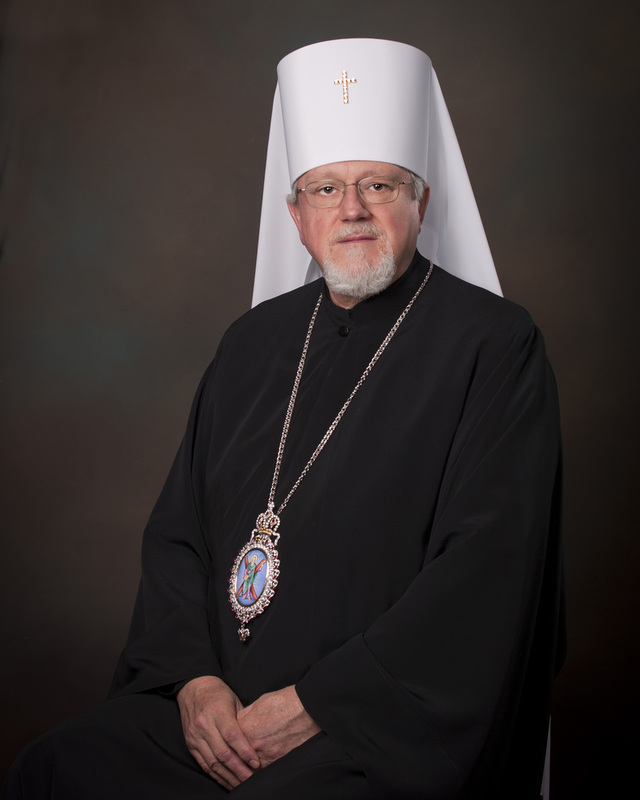 He served as Bishop of the Australia-New Zealand Eparchy for 10 years, in addition to his responsibilities as Bishop in the USA, and was successful in conducting the negotiations, which led to the unity of the two Ukrainian Orthodox Jurisdictions there. Following the declaration of independence in Ukraine, the Bishop traveled many times to Ukraine representing Patriarch Mstyslav and our Church striving for the unity of the church there. He was elevated to the rank of Archbishop in 1992. In 1995 the regular Sobor elected Archbishop Antony as President of the Consistory by where he restructured the Church administration into various ministries with qualified individuals leading them in activities for the benefit of the faithful. He served as President for 17 years until elected as the fourth Metropolitan of our Church at an Extraordinary Sobor following the repose of Metropolitan Constantine in 2012. Metropolitan Antony considers three of the Church’s missionary activities as important parts of his legacy – New Mission Parish Development Fund, our Church’s close working relationship with the Children of Chernobyl Relief Fund and our own Ukrainian Orphanage Adoption Program – the Orysia Federwicz and Natalie Dedeluk Program. These two sisters from California made a generous contribution of $40,000 to assist in the adoption of the first orphanage and following the first College Student Mission trip there, the Church has never had to do any fund raising for this program. 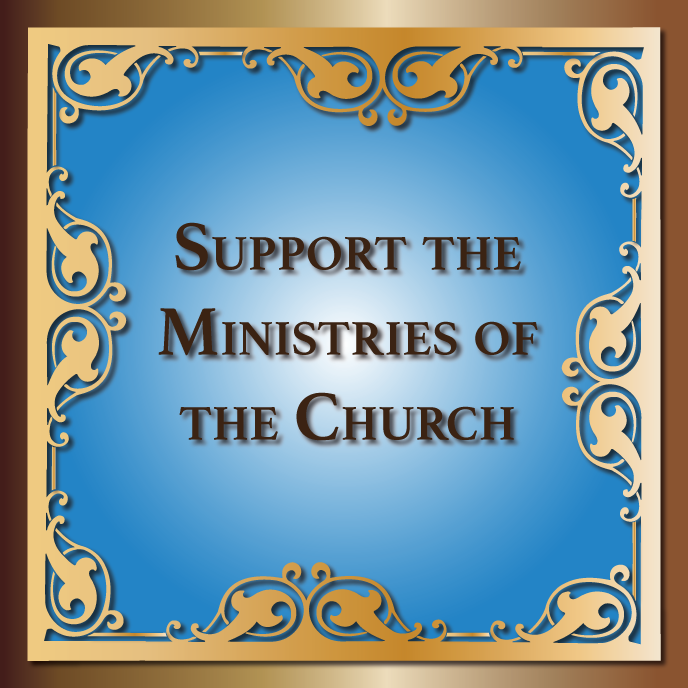 The faithful continually sponsor events to support it. The Mission Fund has been very successful and was created from the proceeds of St. Mary Church, Hicksville, NY, which had to close because the six octogenarians remaining in the parish could no longer support and maintain it. A number of our oldest parishes decided over the past 20 years that it was necessary to close. The New Mission Parish Development Fund has not only enabled us to replace the number of parishes that have closed but actually increased the number of parishes. The Archbishop participated in the meetings of the Standing Conference of Orthodox Bishops in America, the predecessor of the Assembly of Canonical Orthodox Bishops for 10 years. At the first meeting of the Assembly in 2010, he was elected as the first Treasurer of the organization and served for six in the position. 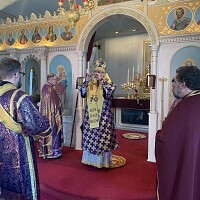 He was enthroned as Metropolitan in January 2013 in St. Andrew Cathedral, Silver Spring, MD with 20 Orthodox hierarchs participating from Canada and the USA, in addition to the Ukrainian Catholic hierarchs from the USA. He is also Metropolitan of the Eparchy of Brazil and Latin America, which is under the Omophorion of the Metropolitan of the Ukrainian Orthodox Church of the USA. A year later, he was elected as Metropolitan of the Ukrainian Orthodox Church in Diaspora, including Western Europe, Australia and New Zealand. The Metropolitan has presided over two additions to the Metropolia Center. The first is Holy Resurrection Mausoleum beneath the Memorial Church. The space was originally designed as a mausoleum, but our Church museum was located there “temporarily” until it was moved to the Ukrainian Cultural Center in anticipation of the construction of a new museum as part of the Ukrainian History and Education Center, the second addition to the Metropolia, which is still under construction as we celebrate our Centennial. In 1987, on 16 August the unveiling and blessing of our St. Ol’ha monument took place and this celebration served as the beginning of a Holy Year of Commemoration in anticipation of the 1,000th anniversary of the Baptism of Ukraine into the Holy Orthodox Faith. This monument was the initiative of the United Ukrainian Orthodox Sisterhoods and Ukrainian women throughout the Diaspora and meant to commemorate this “Equal to the Apostles”, who was perhaps more responsible than anyone else for bringing the Ukrainian nation to Christ. During the national Millennium of Christianity in Ukraine (988-1988) celebration, which took place at the Metropolia Center, the Consistory/Library complex just across the street from the Cultural Center was blessed. It is the nerve center of our entire Church here in the USA. Here and throughout our Metropolia Center property, you have a small group of truly dedicated people who give so much of themselves for you and for the benefit of our Holy Church, accomplishing more than most can even imagine. 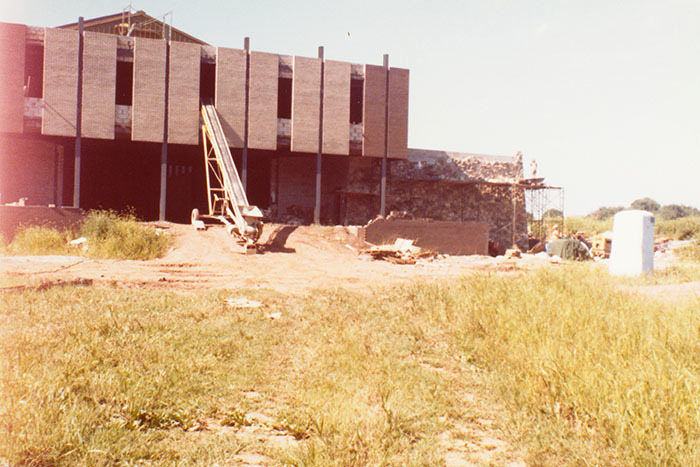 During the construction of the building, for which a major fundraising program was initiated, a company down the street – Davidson Avenue – approached us with an offer to purchase the 17 acres on the far side of Interstate 287, separated from our main property by the US government’s construction of the highway. The sale of this property almost completely covered the cost of construction for the Consistory Administrative building. Another blessing to our Church was received with the creation of a new Central Organization – the St. Andrew Ukrainian Orthodox Society. The driving force behind the organization of the Society was Michael Heretz, a member of the Council of the Metropolia. Founded in 1990 as a religious and charitable organization of the Ukrainian Orthodox Church of the USA, the Society provides humanitarian aid to the needy, orphans, elderly, injured and displaced due to war in Ukraine; financial and logistical assistance to seminaries in Ukraine and scholarships (through the Lewytzkyj Seminarian Scholarship Foundation) for theological students studying abroad and at St. Sophia Seminary; publications of religious literature, assistance towards medical projects and church restorations. The Society supports the Christian spiritual rebirth of the Ukrainian people, the efforts of the Ukrainian Orthodox Church in re-establishing the universal principle of humanity, justice, charity and tolerance, and the full rebirth of the persecuted and devastated Church in the former Soviet Union. Since its founding, the Society has raised over $1.3 million towards its religious, educational and humanitarian projects. Procession with Ecumenical Patriarch Bartholomew and Metropolitan Constantine during the visit of His All-Holiness to the Metropolia Center. October 27, 1997. 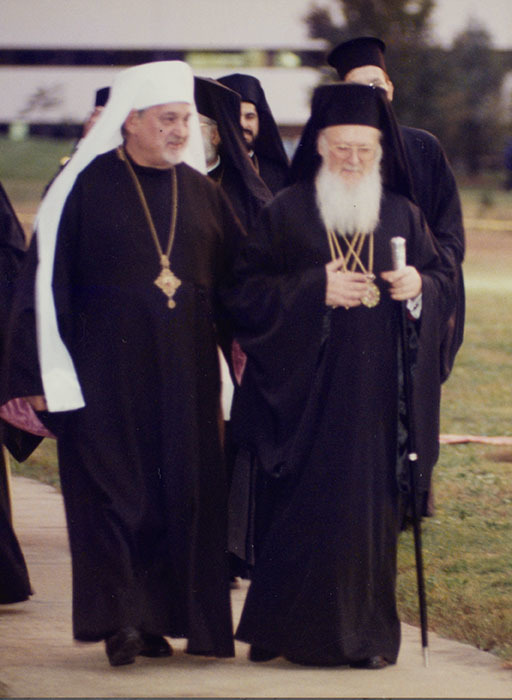 In November 1994, Metropolitan Constantine and Archbishop Antony were invited by the Ecumenical Patriarch, Bartholomew I to visit the Patriarchate to discuss the renewal of the more than one thousand year old relationship to the Patriarchate, from where Ukraine received and was baptized into Orthodox Christianity in 988. The Metropolitan and Archbishop had been appointed by Metropolitan Mstyslav to represent our Church at the funeral of Ecumenical Patriarch Demetrios. Archbishop Antony was appointed to represent the Church at the Enthronement of Patriarch Bartholomew. Archbishop Antony had previously accompanied Patriarch Mstyslav on a visit to Patriarch Bartholomew in early 1991, where Patriarch Mstyslav urged the Ecumenical Patriarch to take action in recognizing the reborn Church of independent Ukraine. Following these discussions a set of points of agreement were presented to the Council of the Metropolia of our Church in February 1995, which approved them as did our regular Church Sobor in October of the same year, with just 17 dissenting votes. These discussions resulted in the reception of the Ukrainian Orthodox Church of the USA as a jurisdiction under the omophorion of the Ecumenical Patriarch, thus returning the Ukrainian Orthodox Church to its rightful place in world Orthodoxy. Our Church retained its structure and independence of administration, which has remained such for 23 years. Our voice was suddenly heard throughout the Orthodox world, including Ukraine. Throughout these 23 years the Patriarch has requested our hierarchs to represent him in many historical events in the life of the Ukrainian nation and her Church. In 1996, Archbishop Antony and Bishop Vsevolod of the Ukrainian Orthodox Church in America held negotiations over the final and long awaited unification of the two Ukrainian Orthodox jurisdictions in the USA – the UOC in America and the UOC of USA into our Ukrainian Orthodox Church of the USA. The Regular Sobor of our Church in 1995 approved the decision to seek and complete such a merger. The Ukrainian Orthodox Church in America held a Special Sobor in our Library the first week of November 1996. At its conclusion Metropolitan Constantine was informed of the good news and instructed that the announcement be made during Divine Liturgy in St. Andrew Memorial Church the following Sunday. Bishop Vsevolod was elevated to the rank of Archbishop and became the ruling hierarch of the Western Eparchy with his Cathedral of St. Volodymyr in Chicago. Metropolitan Constantine served the Central Eparchy with his Cathedral of St. Vladimir in Parma, OH and Archbishop Antony served the Eastern Eparchy with his Cathedral of St. Volodymyr in New York City. Bishop Vsevolod was the son of a priest who worked for 20 years as a family therapist. He completed his theological education in the Warsaw Orthodox Seminary and Dillinden Theological School in Germany. He worked with Metropolitan Andrew Kuschak who ordained him to the priesthood. Bishop Vsevolod served for nine years, from his consecration as bishop in 1987 to 1996, as the Prime Hierarch of the Ukrainian Orthodox Church in America, succeeding His Eminence Metropolitan Andrew Kuschak, who reposed in 1986. This was the diocese of Bishop Bohdan (Spilka) under the jurisdiction of the Patriarchate of Constantinople. 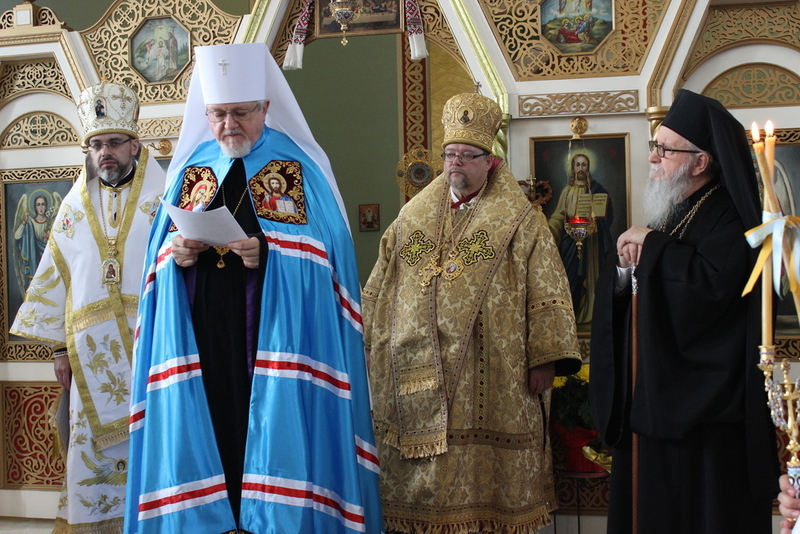 From the moment of his enthronement as the Prime Hierarch, Bishop Vsevolod became involved in ecumenical relations. He was assigned to the Orthodox-Catholic Dialogue, represented the Patriarch in many delegations to academic and pastoral conferences and had good relationships with hierarchs of all faiths. He was very supportive of the Ecumenical Patriarchate and also represented the Patriarch many times in Ukraine meeting with various church leaders and seeking the unity of the Church, boldly proclaiming that the Ecumenical Patriarchate has never abandoned her rights as the Mother Church of Ukraine and had rejected the transfer of the Ukrainian Orthodox Metropolia to the Russian Orthodox Church as noncanonical. 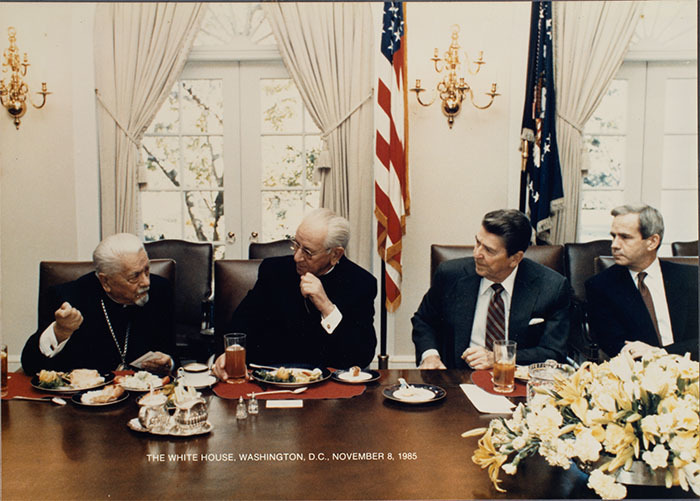 After the 1996 merger of his diocese with our Ukrainian Orthodox Church of the USA and his elevation to the rank of Archbishop, he continued to represent our Church in many ecumenical meetings and conferences, in particular the annual Orientale Lumen conference in Washington, D.C., which gathered representatives of churches from all over the world. He was actively involved with the youth of our Church, in particular he loved the Jr. Ukrainian Orthodox League where he met with the youth for their entire annual convention, hardly visiting the Sr. UOL sessions. The Archbishop reposed in the Lord on 16 December 2007 and is interred at St. Andrew Cemetery. In 1997, we witnessed the blessing of the restored Fisher Family Home – lovingly accomplished by our own staff – remaking it into the beautifully historical home it was meant to be. The original section of the house was built in 1688 and it is now a jewel of the historical legacy of Somerset County, New Jersey. Each year hundreds of visitors tour the home conjuring up in their minds what it must have been like for the original residents who played such an important role in American history. Unfortunately, during a recent installation of a new roof on the building, severe damage was discovered from insect infestation. Presently, architectural plans are being drawn to make the necessary repairs to save this historical building as the oldest residence in Somerset County, NJ. 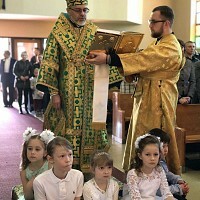 The Church was abundantly blessed once again, literally on the eve of the Second Millennium 2000, with the acceptance into our church of Deacon Volodymyr Zelinsky. The Deacon was born and raised in Ukraine, baptized in a private baptism in the home of the local Orthodox priest in Ivano-Frankivsk, Ukraine. He began his theological studies in Ukraine and completed them at. St. Sophia Seminary. He was ordained to the priesthood in May of 2001 and shortly thereafter tonsured a monk at Protection of the Mother of God Monastery, Dover FL, with the name Daniel. He was assigned to serve the faithful of Holy Ascension Parish, Clifton, NJ. Following Archbishop Antony’s establishment of our Ukrainian Orphanage Adoption Program, Father Daniel was assigned in 2004 as the Spiritual Director of the program. The Church had expanded the program to three orphanages and under the Bishop’s leadership, college mission teams each summer and adult mission teams each year at the Feast of St. Nicholas have traveled to the orphanages conducting renovation projects and most especially bringing joy and love into the lives of Ukraine’s most disadvantaged orphans – the most severely handicapped, both physically and mentally. During the Regular Church Sobor in 2007 the Metropolitan Constantine in behalf of the Council of Bishops nominated Hieromonk Daniel (Zelinsky) for consecration to bishop and the Sobor responded with unanimous approval. Archimandrite Daniel was consecrated in May 2008 at St. Vladimir Cathedral, Parma, OH. He succeeded Archbishop Vsevolod as Bishop of Chicago and the Western Eparchy. Bishop Daniel was called back to the Metropolia Center in 2010 to assume the duties of Dean of Students at St. Sophia Seminary, while continuing to fulfill all his responsibilities as Bishop of Chicago and the Western Eparchy. An important part of his activity at the Seminary was the application to the US Dept. of Homeland Security SEVIS Program seeking approval as an institution permitted to accept foreign students into its academic programs. With this goal achieved, Bishop Daniel set up our program, along with Fr. Bazyl Zawierucha, seminary Provost, to recruit students from Ukraine. He also was the driving force with the assistance of Fr. Francis Rella, behind the Seminary’s successful application to the State of New Jersey Dept. of Education for status as a licensed academic institution. Upon approval the Seminary was granted the right to award the Master of Divinity Degree. As the Provost of the Seminary, the Archbishop has filed the application to the American Theological Schools Association for candidate status for accreditation of our academic program. This is a several year-long process, which will require much effort and need to overcome many challenges as it proceeds. During the Extraordinary Sobor of 2012, when Archbishop Antony was elected Metropolitan, Bishop Daniel was elevated to the rank of Archbishop and elected as President of the Consistory. The Archbishop has traveled to Ukraine dozens of times over the past ten years representing our Church, the Ecumenical Patriarchate and our faithful with the orphans. Metropolitan Antony has also appointed him since 2016 to serve the needs of the Ukrainian Orthodox faithful of Western Europe, including Great Britain. The blessing of Holy Resurrection Mausoleum took place on 7 May 2001, on St. Thomas – Providna Sunday, and became the completion of one of the dreams of Patriarch Mstyslav, who had originally designed the Memorial Church with a mausoleum beneath. There we find the Patriarch’s crypt, which was blessed on 11 June 1994, one year after his repose, and a small museum of his life at the center. Surrounding this central area are another 276 crypts for the interment of Ukrainian Americans active in church and community life. On 14 October of 2001 we blessed the site of the future Historical and Educational Complex Museum in memory of Patriarch Mstyslav, which will complete the Consistory/Library complex building. In the courtyard of this complex will be a permanent monument commemorating the 8 million victims of the genocidal famine. Construction began on the new Museum building several years later after a very long process of architectural design and approval from local township building authorities. That construction continues today. It was the decision of our Church Sobors that no Church general funds be utilized for this construction and after the repression of 2008, the contributions to the effort were severely curtailed and have only recently begun to increase. This has become a long-term project for which we will have to raise significant additional funds. We urge your support of this worthwhile project to ensure that it reaches its full potential. 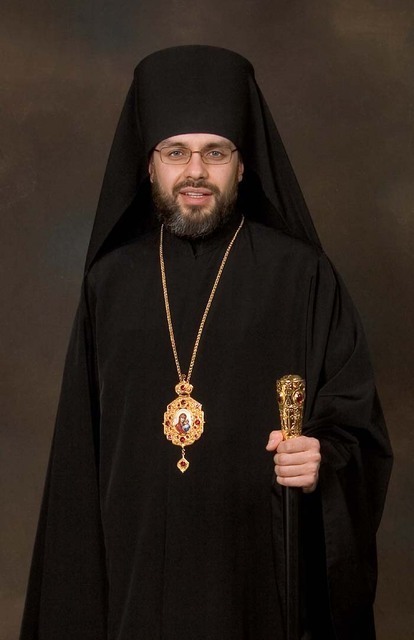 His Eminence Metropolitan Constantine reposed in the Lord on May 21, 2012, after 40 years of archpastoral service in the life of the Ukrainian Orthodox Church of the USA. The Metropolitan led the Church since 1993, having succeeded the late Metropolitan Mstyslav (Skrypnyk). He was a life-long resident of his native Pittsburgh, PA, except for a number of years serving on parish or hierarchal assignments in Chicago, IL and Troy, NY. 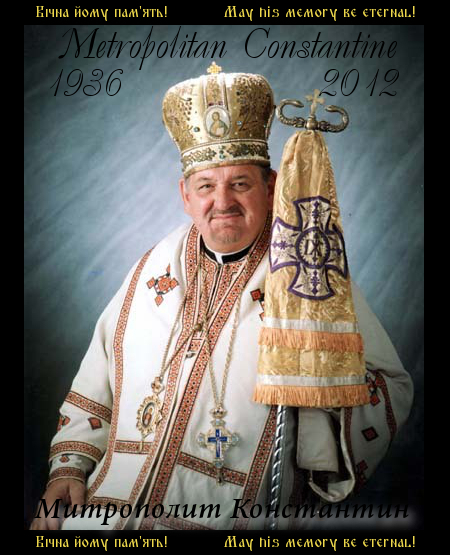 Following the repose of Metropolitan Constantine of blessed memory. His EminenceArchbishop Antony assumed the responsibilities of the Locum Tenens of the Metropolia See of the UOC of the USA. During the Extraordinary Sobor of the Ukrainian Orthodox Church of the USA (October 6, 2012), His Eminence Archbishop Antony was nominated and elected as Metropolitan of the Ukrainian Orthodox Church of the USA. On Saturday, January 26, 2013 - His Eminence Metropolitan Antony was formally Enthroned as the 4th Metropolitan of the Ukrainian Orthodox Church of the USA in St. Andrew the First Called Apostle Ukrainian Orthodox Cathedral in Silver Spring, MD. In the presence of 20 hierarchs, representing various Orthodox jurisdictions of North America and representatives of Catholic and other Christian communities, His Eminence received his Archpastoral staff of the Prime Hierarch of the Church and was greeted by His Eminence Archbishop Demetrios of the Greek Orthodox Archdiocese of America, who is also the Exarch of the Ecumenical Patriarchate. Archbishop Demetrios conveyed formal and private greetings of His All-Holiness Ecumenical Patriarch Bartholomew I to the new Metropolitan of the UOC of the USA. Within the framework of the preparations for the granting of autocephaly to the Orthodox Church in Ukraine, On September 7th, 2018 the Holy Synod of the Ecumenical Patriarchate of Constantinople, under the leadership of His All-Holiness Ecumenical Patriarch Bartholomew I, appointed His Eminence Archbishop Daniel (along with Bishop Ilarion of UOCC) as Exarch of the Ecumenical Throne to Ukraine. In a month following the appointment (9-11 October, 2018) and upon the conclusion of the preliminary work of the Exarchs, the Ecumenical Patriarchate made the historical announcement about the granting of autocephaly to the Holy Orthodox Church of Ukraine. Thousands upon thousands of Ukrainian Americans, Ukrainian world leaders, American Presidents, Senators and Congressmen and Ukrainian Presidents and many other Ukrainian government leaders, as well as people from all faiths have walked this property of our Metropolia Center, blessed 66 years ago and have entered the buildings and institutions established here by the Grace of God and through the inspiration of Metropolitan John, Patriarch Mstyslav and all the bishops and leading clergy of our Church. Many more will come and much more will be accomplished on these hallowed grounds by present and future generations of bishops, clergy and faithful, because God has implanted in us all a love for our Holy Ukrainian Orthodox Church and a desire to pass our rich spiritual and cultural heritage on, intact, to our children and grandchildren. May God give us the continued strength, dedication and will to do so. Українська Православна Церква в США розпочала свою діяльність у 1918 році, коли декілька вже існуючих парафій та духовенство інших Православних та Католицьких єпархій вирішили, що чисельність українського населення в США досягла того рівня, що воно з своєю особливою етнічною ідентичністю повинно мати власну юрисдикцію. Багато питань духовного та політичного характеру надихнули на прийняття цього рішення, яке відразу стало успішним з точки зору чисельності парафій та вірних, які приєдналися до втілення цієї ідеї. Громади шукали і знайшли духовний покров під омофором єпископа Ґерманоса Сирійської Православної Церкви в США. Єпископ Ґерманос надавав необхідну духовну опіку новоутвореній юрисдикції, доки прохання не було відправлене до новоствореної Автокефальної Православної Церкви в Україні, яка утворилася в жовтні 1921 під керівництвом митрополита Василя Липківського після проголошення першої декларації про Незалежність України в 1918 році. Відповіддю на це прохання було призначення на той час архієпископа Іоана (Теодоровича) піклуватися духовними потребами Українських Православних вірних у Сполучених Штатах Америки. Архієпископ Іоан прибув до Сполучених Штатів у 1924 році і відразу взявся за скликання Собору, на якому було б офіційно зформульовано утворення Єпархії Американської-Української Православної Церкви в США. Єпископ Ґерманос офіційно передав свою опіку над Церквою Архієпископу Іоану. Після Собору, під керівництвом архієпископа Іоана, життя Американської-Української Православної Церкви в США почало дійсно процвітати. Архієпископ залишався в тісному контакті з Церквою в Україні, проте до 1927 року стало зрозуміло, що Комуністичний режим не припинить переслідувати цю Церкву, заарештувавши на той час усіх Її ієрархів та більшість духовенства і знищивши більшість Церковного майна. До 1937 року всіх єпископів було страчено і не було залишено жодних ознак існування Церковного життя. На жаль, Українська Автокефальна Православна Церква не мала жодної можливості добитися свого канонічного визнання перед світовим Православ’ям, а рішення та дії зібраного Нею Собору залишаються і досі суперечливими. Майже відразу після закінчення Собору 1921 року була приречена боротьба за існування. Архієпископ Іоан відхилив вимоги юрисдикції Московського Патріархату, який замінив Автокефальну Церкву в Україні та розірвав всі зв’язки з Україною. Американська-Українська Православна Церква в США була глибоко уражена цими фактами, а особливо тим, що Архієпископ Іоан був висвячений, як один з перших трьох єпископів Автокефальної Церкви в Україні і не отримав канонічного визнання світовим Православ’ям. Незважаючи на кілька спроб добитися свого визнання перед Вселенським Патріархатом, прогресу не було досягнуто, і як факт, він не отримав відповіді ні на один з своїх листів. Проте, духовенство та вірні Американської-Української Православної Церкви в США, були без сумніву переконані у своєму прагненні створити власну незалежну церкву, яка продовжувала зростати і розвиватися духовно та матеріально. З центром Єпархії розташованим у Філадельфії, була заснована і семінарія де духовенство, необхідне для служіння духовним потребам вірних, отримувало свою освіту та було призначене на служіння - всі вони до певної міри творили чудеса засновуючи та розбудовуючи нові парафії по цілій країні. Митрополит Іоан повністю занурився в життя нашої Церкви та в Американське суспільство. Він вільно володів англійською мовою, розуміючи, що його вірні, які емігрували до США починаючи з 1880 року, а також між Першою і Другою Світовими Війнами, сильно злилися з новим для них суспільством. Це були українці, які ніколи не знали незалежної України, чи України, як політичної держави. Вони прибули з регіонів України, які були під постійною окупацією сусідніх держав, таких як Австро-Угорська Імперія, Польща та інші. Митрополит дав їм ідентичність, на якій вони могли будувати свою церкву, і він був спроможний робити це на мові, якою всі говорили. Він чітко та легко сформульовував і висловлював свої найглибші теологічні та пасторські промови на англійській мові. Він усвідомлював необхідність залучати молодь до Церкви. У 1947 році під керівництвом о. Володимира Букати та о. Степана Галика-Голютяка, він заснував Українську Православну Лігу – першу Церковну Організацію. Організація функціонує уже 71 рік і є ініціатором багатьох історичних подій у житті Церкви – відкриття нашої власної Семінарії Святої Софії, придбання табору “Всіх Святих” в Емлентоні, штат Пенсільванія, створення стипендійних програм – Стипендіальний Фонд Митрополита Іоана для семінаристів та стипендія Лин Савчук-Шерон Кузбит для членів УПЛ, які вчаться у коледжі чи університеті, видання великої кількості навчального матеріалу та, в кінцевому підсумку, заснування Молодіжної Української Православної Ліги США у 1962 році для підготовки нашої молоді до керівництва та активної участі в житті Церкви. У 1928 році інша група українських Православних Християн в США розпочала свій рух до Православ’я. Через питання, що стосувалось статусу визнання архієпископа Іоана, ця група не дуже то й хотіла асоціювати себе з його уже заснованої юрисдикцією, яка активно розвивалася. Перший Собор цієї групи вірних зібрався в Аллентаун, штат Пенсільванія, навесні 1929 року утворивши Українську Православну Церкву в Америці. Отець Др. Йосиф Жук був обраний адміністратором організування єпархії, а на Другому Соборі у 1931 році в м. Нью-Йорку його було обрано першим єпископом. У 1932 р. два ієрархи Сирійської Православної Церкви в США висвятили Єпископа Жука у Катедрі Св. Володимира на 14-й вулиці в Нью-Йорку. На жаль, Єпископ Йосиф прожив менше двох років після своєї висвяти. У 1936 році Вселенський Патріарх прийняв Українську Православну Церкву в Америці під свій омофор, а в 1937 році єпископ Богдан (Шпилька) був висвячений на єпископа для діючої єпархії. Під його опікою юрисдикція також почала розвиватися надзвичайним темпом зростання чисельності парафій та вірних, майже конкуруючи із зростанням Американської-Української Православної Церкви США під керівництвом архієпископа Іоана. Дві Українські Православні юрисдикції співіснували в США протягом наступних 17 років. Вони обидві розширювалися, архієпископ Іоан крім США очолив Українську Православну Церкву в Канаді, а єпископ Богдан в свою чергу заснував декілька парафій в Канаді. У 1942 році під час короткого послаблення релігійних переслідувань в період німецької окупації України Православна Церква в Україні знову була відроджена як частина Польської Автокефальної Православної Церкви на чолі з митрополитом Діонісієм (Валединським). Одним з єпископів, висвячених для відродженої церкви у 1942 році в Києві був єпископ Мстислав (Скрипник), який пізніше прибув до Канади, щоб очолити там Українську Православну Церкву, яку він перебрав від архієпископа Іоана. Через кілька років єпископ Мстислав, із згоди Вселенського Патріархату, залишив Канаду і прибув до Сполучених Штатів, щоб приєднатися до юрисдикції єпископа Богдана. Єпископ Мстислав, будучи канонічно висвяченим, переконав архієпископа Іоана бути перевисвяченим, щоб тим самим вирішити всі канонічні питання стосовно його канонічності і започаткувати передумови для об’єднання двох Церков. У 1949 році архієпископ Іоан погодився і був висвячений єпископом Мстиславом та митрополитом Христофором Екзархом Олександрійського Патріархату в США. “Від сьогодні наші Церкви, Американська-Українська Православна Церква в Сполучених Штатах Америки та Українська Православна Церква в Америці об’єдналися і утворили Єдину, Святу Українську Православну Церкву Сполучених Штатів Америки, яка з цього дня і надалі буде жити і діяти, як Митрополія під одним духовним керівництвом та керуватися однією конституцією, яку ми одночасно колегіально ратифікуємо та приймемо”. Ми можемо сомі тільки уявити ту величезну радість, яку відчували учасники цього спільного Собору, слухаючи ці слова та вбачаючи майбутнє життя їхньої Святої Української Православної Церкви. Це була радість, відлуння якої звучало по всьому світу. Протягом наступних двох десятиліть ще більше парафій приєдналися до об’єднаної Церкви, а також ще були засновані нові громади прибулими іммігрантами з таборів у Німеччині. Незважаючи на те, що єпископ Богдан вирішив залишитися за межами новооб’єднаної Церкви, він був присутній на спільній Літургії, щоб бути свідком цієї події. На наступний же день, розпочалася клопітка робота в Консисторії, якою керував архієпископ Мстислав, наполегливо прагнучи привести до Церкви якомога більше Православних українців тут у США. В перші місяці Рада Митрополії часто зустрічалася, щоб прийняти рішення, необхідні для побудови міцної основи організаційного життя Церкви. На червневому засіданні Ради 1951 року, було запропоновано придбати фермерську земельну ділянку у розмірі 57 акрів, в центрі штату Нью-Джерсі, недалеко від Українського Села – літньої резиденції та громадського центру Катедри Св. Володимира міста Нью-Йорку. Протопресвітер Лев Веселовський, який на той час був настоятелем Катедри, переконав наших Ієрархів роздумати над пропозицію та підтримати її. Земельна ділянка спочатку була майном делегата від штату Нью-Джерсі до Континентального Конгресу Сполучених Штатів - Генріха Фішера. Пропозиція надана Раді Митрополії підкреслювала історичний зв’язок з Американською історією і те, що рельєф території разом із будинками та зручне розташування, послужили б найбільш відповідним місцем для Адміністративного Центру та Осередку Митрополії Української Православної Церкви США. У 1951 році єпископат Церкви збільшився з прибуттям та прийняттям єпископа Володимира (Малеця), якого було призначено до парафії Покрова Пресвятої Богородиці в Детройті. У 1957 році він став архієпископом і прослужив ще 20 років перед тим, як упокоївся у Господі у віці 77 років, у липні 1967 року. Архієпископ Володимир був високо освіченим богословом, який навчався в Київській Духовній Академії на Україні та викладав у своїй Черкаській Єпархії, після свого висвячення у 1944 році митрополитом Діонісієм з Варшави. Він емігрував на Захід з більшістю ієрархів Української Автокефальної Православної Церкви в 1944 році, спочатку до Варшави, а потім до таборів у Німеччині, де він продовжував бути членом Синоду єпископів для Церкви до його від’їзду і прибуття до Української Православної Церкви США у 1951 році. Архієпископ дуже любив писати і щомісяця подавав нові статті до наших церковних видань, таких як Українське Православне Слово. Духовенство, яке мало змогу промовляти на його похороні, висловлювали йому свою вічну подяку за те, що мали можливість почерпнути знань через його праці у багатьох сферах богослов’я та літургійної практики. Коли читаєш протокол Ради Митрополії за 1951 р., здається що ентузіазм тоді присутніх щодо придбання землі нібито переливається на тебе, коли відразу ж усе духовенство та вірні почали складати свої перші пожертви на придбання земельної ділянки, яка коштувала $90 000 - на той час велика сума: о. Лев Веселовський, о. Дмитро Д. Лещишин, о. Іван (пізніше архієпископ Марко) Гундяк та о. Микола Кашуба всі пожертвували по $500. Відразу після них, пожертви склали: архієпископ Мстислав $200, о. Веcеловський (до своєї першої пожертви доклав ще $500), член Ради Митрополії Олексій Гелелюк $250, Григорій Пипіюк, о. Іван Гундяк, о. Андрій Бек, о. Микола Кашуба кожен дав по $50 та професор Василь Завітневич - 25 доларів. Усього за кілька хвилин було зібрано $3125 - це була величезна сума грошей за один день. Після такого вираження ентузіазму, без сумніву, пропозиція була схвалена одностайно. Це звернення було успішним, і освячення землі було заплановано на 1 червня 1952 року. Через триденний літній дощ, освячення було неможливо провести на території. Незважаючи на дощ, приїхало понад 2,500 вірних, в той же час морально підтримавши організаторів події. Вся програма, включаючи Божественну Літургію, була перенесена в зал місцевої школи, куди змогли поміститися близько 1 200 чоловік. Усі коридори та класні кімнати були переповнені вірними. Дехто навіть залишився у своїх автомобілях та автобусах. Понад 30 священиків, 5 дияконів та 30 прислужників брали участь у богослужінні з митрополитом Іоаном та архієпископами Мстиславом і Геннадієм, а хор із Катедри Св. Володимира в Нью-Йорку, у поєднанні з хористами місцевих парафіяльних хорів міст Картерету та Нюарку співали Божественну Літургію. Під час Божественної Літургії промовляли всі три архієреї. Митрополит Іоан говорив про велику роль Українських Православних релігійних центрів у житті нашого Українського Народу – таких, як Києво-Печерська Лавра у Києві. Він нагадав усім про велику відповідальність, покладену на нас Богом у цьому Осередку, заснованому всього навсього сім місяців тому назад. Архієпископ Мстислав зазначив постійне зростання Української Православної Церкви США з дня Об’єднавчого Собору в 1950 році та особливо з нещодавнім заснуванням багатьох парафій прибулими іммігрантами з Європи. Завершуючи свою промову, архієпископ - завжди дивлячись в майбутнє - закликав усіх вірних зробити свій внесок у фонд будівництва Церкви-Пам’ятника, яка буде побудована на території у м. Саут Баунд Бруці – в пам’ять про мільйони жертв, тих хто віддали своє життя за незалежність України та Сполучених Штатів Америки. Перенесене освячення землі разом із приміщеннями, бібліотекою, архівом та друкарнею відбулося 21 вересня 1952 р. – на Свято Різдва Пресвятої Богородиці. 1 500 людей взяло участь у цьому святкуванні. Вони мали можливість перейти і роздивитися все навкруги, навіть наблизитися до тимчасового престолу, який знаходився на місці, де сьогодні стоїть наша Церква-Пам’ятник. За престолом була красиво оздоблена ікона Божої Матері. Митрополит Іоан та Архієпископ Мстислав співслужили Божественну Літургію. Це був прекрасний день, на якому відбувся урочистий концерт, перенесений через погодні умови з запланованого освячення землі у червні. У заході взяли участь 56 священиків, які відразу ж провели першу Конференцію Духовенства УПЦ США після Об’єднавчого Собору. Того пізнього літнього дня - 21 вересня 1952 р. - єдиними будинками, що знаходилися на території Осередку під опікою Святого Апостола Андрія Первозванного, були родинний дім Фішерів, який став Консисторією та резиденцією для Архієпископа, друкарня де друкувалося “Українське Православне Слово”, невеличкий будинок, де жив скарбник Консисторії, та млин, який слугував як церковний зал бібліотека/архів та школа українознавства і релігієзнавства. Протягом років багато інших приміщень було побудовано на цьому святому місці. Сталося багато змін і доповнень. У 1954 році управа околиці Франклін дала дозвіл на відкриття Свято-Андріївського цвинтаря. Це стало можливим лише тому, що родинний цвинтар Фішерів, історичне місце, за яким наша Церква і досі доглядає був розташований на нашій території. Цвинтар був освячений 26 вересня 1954 року. Поховання почалися практично відразу. На даний час цвинтар нараховує майже 15 тисяч могил, що знаходяться на 25 акрах землі, включаючи продовження цвинтаря біля Семінарії та Консисторії. “Церква-Пам’ятник — це спільний монумент над могилами наших попередників та рідних і найдорожчих нам. Церква-Пам’ятник — це вияв глибокої пошани до героїв і мучеників українського народу. Церква-Пам’ятник — це дуже скромний хрест над заораними ворогом могилами мільйонів-жертв Великого Голоду. Церква-Пам’ятник — це лише скромна спроба відтворити велич українських святинь, що їх зруйнувала Москва тільки в ХХ столітті. Церква-Пам’ятник — це твір вільного українського духа, нерозривно пов’язаний з давнім українським церковним будівництвом. Церква-Пам’ятник — це наш скромний вклад в скарбницю духових і культурних вартостей США. Ми можемо тільки додати, що Церква-Пам’ятник більше ніж що небуть інше, стала символом нашої Української Православної Церкви США та символом нашого Духовного Осередку, Центру Митрополії – Українського Єрусалиму, як говорив Архієпископ/Митрополит/Патріарх Мстислав. У 1952 році була заснована бібліотека – в приміщенні млина родини Фішерів, в якому також знаходилася наша перша церква Св. Андрія. Бібліотека була створена для збереження українських історичних, богословських, культурних та літературних книг, які систематично руйнувалися радянським режимом в Україні. На жаль, це церковне приміщення та зал були зруйновані пожежею у 1964 році. Однак, бібліотека була збережена і пізніше перевезена в підземні приміщення нещодавно закінченої Церкви-Пам’ятника Св. Андрія. На початку 1980-х років, після завершення будівництва Українського Культурного Центру, бібліотека була перенесена до Культурного Центру та з’єднана з швидко зростаючою бібліотекою Свято-Софіївської Семінарії, для якої не вистачало місця в Семінарії. У 1988 році, до 1000-ліття Хрещення Русі-України, було завершено будівництво нової Консисторії та спеціального бібліотечного приміщення, куди на постійно перевезли об’єднані бібліотеки. У середині 1950-х рр., наш єпископат збільшився з прибуттям архієпископа Володимира (Малеця) з Європи, який був прийнятий митрополитом Іоаном та архієпископом Мстиславом і призначений до Катедри Покрови Пресвятої Богородиці в м. Детройті, штат Мічиган. Владика Володимир розбудував життя Українських Православних громад по усій Центрально-Західній частині США, де наша Церква ще не мала призначеного єпископа. У 1960 році плани Уряду вплинули на наше Церковне життя, коли Федеральний Уряд розпочав будівництво державної магістралі І-287 забравши від нас 4 акри землі та відокремивши від основної частини нашого майна ще 18 акрів, які розділила магістраль. За 4 акри ми отримали компенсацію в розмірі $21 600, що було в 5 разів більше, ніж те, що ми заплатили за цю територію в 1951 році. За 18 акрів, які відділила від нас дорога, ми отримували багато пропозицій протягом багатьох років, але з добрим передбаченням, архієпископ Мстислав відмовлявся продавати цю ділянку, називаючи її нашим забезпеченням на майбутнє. У 1961 році ще одне благословення зійшло на нашу Церкву, коли митрополит Іоан та архієпископ Мстислав благословили утворення нової Центральної організації – Об’єднання Українських Православних Сестрицтв (ОУПС). Це була організація, яка представляла усі сестрицтва при наших парафіях по всій країні. Вступ до організації був добровільним з боку парафіяльних сестриць, в один час організація нараховувала 46 задіяних сестрицтв. У 1961 році на перших загальних організаційних зборах, які відтоді відбувалися кожні 3 роки ОУПС вибрала Управу. Діяльність цієї організації значно перевищила кількість людей, які належали до Управи в будь-який час її існування. ОУПС видавало багато публікацій, серед них “Англійську Енциклопедію України для дітей” та щомісячний журнал “Віра”. Надзвичайно успішна стипендіальна програма понад 50 років надавала фінансову допомогу студентам – членам нашої Церкви в США, Південній Америці та Незалежній Україні. Протягом останніх 15 років організація внесла десятки тисяч доларів до фонду будівництва Музею та спонсоруватиме постійну виставку про Голодомор в Україні. На жаль, на даний час ОУПС не є діючим через фінансову кризу спричинену діями її скарбника. У 1962 році архієпископ Генадій з Катедрою Святої Тройці, через розбіжності з іншими ієрархами, вирішив залишити Українську Православну Церкву США. Через два роки він зі своєю парафією перейшов до Української Православної Церкви в Америці під омофором Вселенського Патріархату, де він і залишився до своєї смерті в 1973 році. У 1967 році єпископ Олександр (Новицький) був висвячений на єпископа Чиказького. Він, на жаль, послужив тільки три роки через свою передчасну смерть у 1970 році. Єпископ Олександр підтримував бачення митрополита Іоана щодо Української Православної Церкви США. Він також усвідомлював необхідність старанно працювати з молоддю Церкви з метою зберегти її відданою Христу через нашу Святу Церкву. У 1970 р. Єпископ Марко, тодішній о. Іван Гундяк, довголітній настоятель парафії Св. Димитрія в Картереті, штат Ню-Джерсі, був висвячений на єпископа-помічника для Східної Єпархії під архієпископом Мстиславом. У 1971 році він став архієпископом і залишився на парафії Св. Димирія, якій було надано звання Катедри, де він служив настоятелем 52 роки до своєї смерті в липні 1984 року. Архієпископ тісно співпрацював з Українською Православною Лігою і був одним з перших священиків, що служили нашій Святій Церкві з дня Її заснування у 1918 році. Велике горе сталося в житті нашої Церкви в травні 1971 р., коли відійшов у вічність Блаженніший Митрополит Іоан Теодорович, наш правлячий ієрарх з 1924 по 1971рр. – 47 років любові та близькості до дітей Церкви. Коли він відвідував парафії, діти приходили до нього через його очевидну любов до них, і він казав їм усім назвати його “Дідусем”, багато хто, до сьогодні пам’ятає це. Митрополит постійно прагнув зберегти єдність Церкви, коли стикався з розбратом між різними хвилями іммігрантів, які складалися з мирян та духовенства Церкви. Він прагнув бути пастирським єпископом для своєї пастви, добрим адміністратором, справжнім педагогом, богословом, філософом та вчителем. Він організував першу семінарію близько 1940 року у своїй Катедрі у Філадельфії, де він особисто керував освітою перших американських студентів, які народилися в нашій Церкві, яких він пізніше висвятив на священиків, серед них були о. Франко Лаврик, о. Степан Ганкевич, о. Степан Галик-Голутяк та інші. Митрополит Іоан брав участь у придбанні та розбудові Осередку Митрополії з 1952 року до своєї смерті. Він був плідним письменником і був справжнім пастирським прикладом для духовенства Церкви. Митрополит не допустив, щоб нескінченні питання про його єпископське висвячення, стримували його від справжнього і відданого служіння нашому Господу. Він просто розумів, що Бог розсудить, чи він є “канонічний” чи ні. Митрополит похований на Свято-Андріївському цвинтарі біля Церкви-Пам’ятника в Осередку Митрополії. Після смерті митрополита Іоана у 1971 р., архієпископ Мстислав був обраний митрополитом нашої Церкви і перебрав на себе обов’язки керівництва цього ж року. До того, він послужив Церкві 21 рік як архієпископ та Голова Консисторії, а тепер йому було призначено послужити Церкві ще 22 роки як Митрополит, до його смерті у 1993 році у віці 95 років. Важко навіть описати таланти та здібності цієї людини, яка віддала все своє життя служінню Українській Нації та Святій Українській Православній Церкві. Він служив лейтенант-полковником в уряді свого дядька Симона Петлюри, а звідти був представником Волинської Області України (тодішньої частини Польщі) у Польському Сеймі, де представляв Український Народ даної території. Він почав бути дуже задіяним у житті Церкви і був обраний, під час Німецької окупації України, на єпископа Автокефальної Церкви під духовним керівництвом Митрополита Варшавського Діонісія. Його висвята відбулася в той же період часу, що і висвята ще декількох інших єпископів, у Соборі Святого Андрія в Києві, для служіння відродженої Української Автокефальної Церкви. Коли комуністи зробили свій вирішальний крок, щоб захопити всю Україну, єпископ Мстислав та більшість інших ієрархів Церкви були змушені втікати на Захід. Він залишився в Німеччині у складі Священного Синоду Єпископів, реорганізованого там під керівництвом митрополита Полікарпа (Сікорського). У 1948 році він емігрував до Канади для служіння Українській Грецькій Православній Церкві. Через різноманітні конфлікти, він вирішив переїхати з Канади до США, де був прийнятий в Українську Православну Церкву в Америці, яку очолював єпископ Богдан (Шпилька). Як зазначалося раніше в цьому документі, він був рушійною силою у процесі перевисвяти митрополита Іоана та об’єднанні двох Українських Православних юрисдикцій в Українську Православну Церкву США. Коли вже об’єднана Церква купила землю у Саут Баунд Бруці, штат Нью-Джерсі, яка пізніше стала нашим Центром Митрополії, обидва митрополит Іоан та архієпископ Мстислав приклали усі свої багаті таланти старанню привести всі наші парафії, духовенство та вірних до однодумності та мети побудувати Український Православний Центр, який би конкурував з подібним на Україні. Владика Мстислав був дуже сильним адміністратором і витрачав всю свою енергію на будівництво комплексу, яким ми його бачимо сьогодні. Він не вважав себе богословом, а скоріше істориком, здатним запам’ятати уроки історії та використати їх, щоб переконати Церкву про шлях у майбутнє. Він ніколи не покидав сподівань, що побачить в своєму житті незалежну Україну та відродження Української Православної Церкви. Він постійно заявляв, що ми повинні бути завжди готовими до того дня, що він настане, і що ми повинні зробити все, щоб зберегти спадщину нашої Віри та нашої Нації для тих, хто страждав так довго і жахливо під час Радянського режиму. Він постійно засуджував дії Радянської влади протягом всього існування режиму та вимагав цього від решти світу – у тому числі, будучи в кабінеті в Білому Домі з Рональдом Рейганом, “наставляючи” його, як провести свою першу зустріч з російським лідером Горбачовим. Слабким місцем Митрополита в управлінні Українською Православною Церквою США було те, що він ніколи не міг зрозуміти двох хвиль української імміграції, які будували нашу Церкву на міцному фундаменті протягом 35 років перед його прибуттям до США. Ці дві хвилі імміграції давним-давно глибоко злилися з американським суспільством. Вони ніколи не знали, чи бачили гноблення радянського режиму проти України, часом не можучи осмислити долю тих, хто зазнав цих репресій. Митрополит був постійно розчарований, коли стикався з розбіжностями, а іноді й конфліктами між цими хвилями імміграції та третьою хвилею, частиною якої він був. Незважаючи на це, коли він зустрічався і говорив з однією хвилею імміграції, його присутність та харизма були надихаючими. Він легко міг відобразити реальність того, що відбувалося з Українським народом та нацією. Після того, як Україна стала незалежною, а Церква знову відродилася – третє відродження Автокефальної Церкви – він був вражений, коли його повідомили, що він був обраний першим Патріархом тієї Церкви. Він став символічною постаттю, поєднанням до і після комуністичної України. Великий символ з сильним голосом – навіть у віці 92 роки, коли він вперше з 1944 року повернувся на Україну, як герой, який вірив, що Церква мусить бути моральною свідомістю нації. 7 травня 1972 року був ще одним історичним днем у житті Української Православної Церкви США, коли людина народжена а Америці стає першим американським єпископ для Церкви в особі о. Федора Багана, який прийняв монаший постриг з іменем Константин та був рукоположений у Катедрі Св. Володимира, м. Філадельфія, штат Пенсильванія. Це було величезним кроком у житті нашої Церкви, але як виявилося також надзвичайно позитивним кроком, коли молодий єпископ Константин завоював серця та любов тих, хто противився ідеї обрання на єпископа кандидата американця українського походження у третьому поколінні. Преосвященніший Єпископ Константин, був призначений єпископом Чиказьким, що знову зблизило його з своїм наставником, протопресвітером Федором Білецьким, тепер уже будучи не учнем, а наставником для о. Федора. Владика вирішив розбудувати Чиказьку Єпархію та об’єднати всіх Українських Православних Християн у справжній відданості до Господа та вірних у своєму прагненні не тільки зберегти нашу велику Українську Православну духовність, але укріпивши, передати її наступним поколінням. Робота владики не обмежувалася лише територією Чикаго. Він відвідував парафії по всій Америці, Європі, Австралії та Південній Америці добре представляючи нашу Церкву та заохочуючи вірних у всіх місцях - завжди зосереджуватись на молоді та їхній ролі в майбутньому Церкви. Митрополит брав участь у комітеті створення Свято-Софіївської Семінарії в 1975 р., та був провідним прихильником намагань Української Православної Ліги придбати табір “Усіх Святих” у 1977 р. Він був Ректором Семінарії 25 років та Духовним Наставником Української Православної Ліги 35 років. У 1986 році владика Константин став архієпископом. Він, наслідуючи приклад, митрополита Іоана, був особливо відданим праці з молоддю нашої Церкви, щороку відвідуючи табір “Всіх Святих”. Після розпаду Радянського Союзу та з незалежністю України, архієпископ здійснив декілька візитів до України, намагаючись сприяти там єдності Церкви. Під час Собору 1992 року, Патріарх України та Митрополит нашої Церкви тут у США Мстислав, висунув кандидатуру архієпископа Константина для підвищення його до сану Митрополита, що Собор підтримав. У 1993 році, після смерті Патріарха Мстислава, митрополит Константин був обраний Первоієрархом УПЦ США, очолюючи Церкву 19 років аж до смерті в травні 2012 року. Важливим внеском митрополита Константина було успішне примирення третьої хвилі іммігрантів з двома попередніми хвилями. Страх, що ми маємо американського ієрарха швидко зник, коли люди побачили що він у своїх словах та на ділі повністю розуміє думки і переживання усіх вірних доручених йому Господом в опіку. У 1972 році Бог обдарував нас ще одним подарунком – Маєтком родини Хезерінгтон, яка заснувала Нью-Йоркську Фондову Біржу. Їхній маєток, прямо через ставок від нашої першої земельної ділянки, був запропонований нам для покупки. Це було бажання родини, щоб наша Церква мала першу можливість придбати цю нерухомість. Милістю Божою, наші вірні зацікавились пропозицією і надали свою підтримку пожертвами та позиками, щоб зробити цю покупку можливою. Було придбано п’ятдесят акрів землі в ціну $50 000 за акр. Було багато сумнівів з усіх сторін щодо того, чи зможемо ми сплатити взятий на себе борг. Але і цього разу Господь нам допоміг. До нас звернулася будівельна компанія з проханням купити у нас 15 акрів землі, які колись відділила від нас І-287 дорога. Коштів, отриманих від продажу цієї землі та щедрі внески від наших парафій та вірних було достатньо для того, щоб сплатити борг. У 1975 році у будинку родини Хезерінгтон був зроблений капітальний ремонт і будинок став Українською Православною Богословською Семінарію Святої Софії. Того ж року, у вересні двері цього поважного закладу відкрилися для навчального року і на сьогодні майже половина нашого духовенства отримала там богословську та пастирську освіту. Семінарія поступово зростала за своїми можливостями та програмами. У 2015 році вона отримала ліцензію штату Нью-Джерсі нагороджувати випускників дипломом Магістра Богослів’я. Вчена Рада та викладацький склад на даний час готуються до акредитації закладу через Американську Асоціацію Богословських Шкіл, першим кроком якої є статус кандидата. Окрім нової заочної програми навчання та відносно невеликої кількості студентів, що народилися у США, які подають заяви на навчання в семінарії, кількість студентів збільшилась через абітурієнтів з України. Еміграційний Департамент США “SEVIS” офіційно визнав Семінарію установою спроможною брати на навчання іноземних студентів. У травні 2018 року Семінарія завершила свій 42-ий безперервний рік успішного навчання. 14 вересня 1980 року Український Культурний Центр був освячений та вперше вжитий після дуже довгого будівництва та отримання усіх дозволів. Він є присвячений Тисячоліттю Православ’я на Україні та є пам’яткою усім церквам, бібліотекам та архівам, зруйнованим під час комуністичного режиму в ХХ столітті. Протягом свого існування він слугував, як центр Українського Мистецтва, освіти - нашої Школи Українознавства та Релігієзнавства, соціальної та культурної діяльності для української громади Нью-Йорка та Нью-Джерсі та для інших потреб нашої Церкви. У Культурному Центрі тимчасово зберігаються експонати нашого церковного музею, доки не завершиться будівництво нового Історичного та Освітнього Музею. Церковні архіви також розміщені в Культурному Центрі. Український Культурний Центр є джерелом постійного фінансового прибутку, що допомагає утримувати Осередок Митрополії протягом уже 38 років. 23 жовтня 1983 року був освячений вражаючий пам’ятник митрополиту Василю Липківському. Митрополит є мучеником нашої Святої Української Православної Церкви. Без сміливості, яку він показав, проте дехто це осуджує, наша Церква сьогодні не існувала б тут у США. Він пробудив свідомість у вірних про їхню Українську Православну Віру та духовну спадщину, передану їм їхніми предками – святими та мучениками, які віддали життя оберігаючи цю спадщину. На регулярному Церковному Соборі у 1981 році, Собор Єпископів висунув кандидатуру народженого в США о. Івана Щерби для обрання на єпископа нашої Святої Церкви. Він прийняв монашество в 1983 році з іменем Антоній – в честь святого Антонія Великого, день пам’яті якого припадає на день народження обраного кандидата. У 1985 році єпископ Антоній був рукоположений в Церкві-Пам’ятнику Святого Андрія в Осередку Митрополії. Він був негайно призначений Провостом Свято-Софіївської Семінарії та редактором англійської версії видання Українського Православного Слова. Восени 1985 року єпископ Антоній на прохання митрополита Мстислава вирушив до парафій, звертаючись за допомогою для фонду правового захисту одного з наших парафіян – пана Івана Дем’янюка. Архієпископ продовжував займатися захистом пана Дем’янюка протягом 20 років добившись скасування вироку в Ізраїлі про його вину, аж доки Дем’янюк не помер в будинку перестарілих в Німеччині. На додаток до своїх обов’язків єпископа в США, він був призначений єпископом Австралійсько-Ново-Зеландської Єпархії протягом 10 років, де був успішним у проведенні переговорів, що призвели до єдності дві Українські Православні Юрисдикцій. Після проголошення незалежності на Україні, владика Антоній багато разів відвідував її, представляючи Патріарха Мстислава та нашої Церкви бажання об’єднання Церкви. У 1992 році він став архієпископом. На регулярному Соборі 1995 року Архієпископа Антонія обрали Головою Консисторії, де він переорганізував Церковну адміністрацію на різні відділи з кваліфікованими працівниками, які працювали на благо вірних. Він опікувався Консисторією протягом 17 років, доки не був обраний четвертим Митрополитом нашої Церкви на Надзвичайному Соборі після упокоєння митрополита Константина в 2012 році. Його трьома головними заслугами є: розвиток Фонду Допомоги Новим Місійним Парафіям; тісні робочі зв’язки нашої Церкви з Фондом допомоги дітям Чорнобиля; та нашою програмою допомоги дитячим будинкам-сиротинцям в Україні – Програмою Орисі Федервич та Наталії Деделюк. Ці дві сестри з Каліфорнії зробили щедрий внесок у розмірі $40 000, щоб знайти і допомогти сиротинцю та організувати першу поїздку Місійної Групи Студентів. Відтоді Церкві ніколи не приходиться збирати ніякого додаткового фінансування для цієї програми. Вірні постійно жертвують на підтримку цієї програми. Фонд Допомоги Новим Місійним Парафіям був дуже успішним і був заснований з доходів Церкви Пресвятої Богородиці, Хіксвілл, штат Нью-Йорк, яка закрилася через те, що на ній залишилося тільки шість стареньких парафіян, які більше не могли її утримувати. Ряд наших найстарших парафій протягом останніх 20 років вирішили, що їм також необхідно закритися. Фонд Допомоги Новим Місійним Парафіям допоміг нам відкрити більше число нових парафій ніж закрилося старих. Владика Антоній брав участь у засіданнях Постійної Конференції Православних Єпископів в Америці (в минулому Асамблея Канонічних Православних Єпископів) протягом 10 років. На першому засіданні Асамблеї в 2010 році він був обраний першим Скарбником організації та був переобраний на цю посаду шість разів. У січні 2013 р. він, як Митрополит був інтронізований в Катедрі св. Андрія, Сілвер Спрінг, штат Меріленд. 20 Православних ієрархів з Канади і США були присутні на інтронізації, не враховуючи Українських Католицьких ієрархів з США. Владика Антоній також є митрополитом Бразильської Єпархії та Латинської Америки, які знаходяться під омофором митрополита Української Православної Церкви США. Рік після того, він був обраний Митрополитом Української Православної Церкви в Діаспорі, включаючи Західну Європу, Австралію та Нову Зеландію. Митрополит керував двома проектами будівництва в Осередку Митрополії. Перший – мавзолей Святого Воскресіння під Церквою-Пам’ятником. З самого початку це приміщення було розроблене як мавзолей, але Церковний музей “тимчасово” був перенесений туди доки для нього не появилося місце у Українському Культурному Центрі, сподіваючись на будівництво нового музею в складі Українського Історичного та Освітнього Центру – другий проект будівництва Митрополії, який все ще перебуває в стані будівництва. 16 серпня 1987 року відбулося відкриття та освячення пам’ятника Святій Рівноапостольній Княгині Ользі, і це свято стало початком святкувань в очікуванні 1000-ліття Хрещення України у Святу Православну Віру. Цей пам’ятник був ініціативою Об’єднання Українських Православних Сестрицтв та Українських жінок усієї Діаспори, і був встановлений для вшанування “Святої Рівноапостольної Ольги”, яка мабуть, більш за всіх послужила у наверненні Українського Народу до Христа. Під час святкування Тисячоліття Християнства на Україні (988-1988 рр. ), яке проходило в Осередку Митрополії, було освячено приміщення Консисторії/Бібліотеки, що знаходиться навпроти Культурного Центру. Митрополія – це головний центр нашої Церкви тут в США. Тут працює невелика група присвячених людей, які жертвують собою на благо нашої Святої Церкви, виконуючи більше, ніж більшість навіть може собі уявити. Під час будівництва консисторії, був створений фінансовий фонд та спеціальний збір коштів. На щастя, до нас звернулася компанія розташована на Дейвідсон Авеню з пропозицією придбати в нас 17 акрів землі. Продаж цього майна практично повністю покрив вартість будівництва адміністративних будівель Консисторії. Ще одне благословення для нашої Церкви було утворення нової Центральної Організації - Українського Православного Товариства Святого Андрія. Головною рушійною силою Товариства був Михайло Герець, член Ради Метрополії. Засноване у 1990 р., як релігійна та благодійна організація Української Православної Церкви США, Товариство надає гуманітарну допомогу потребуючим, сиротам, людям похилого віку, постраждалим та переселенцям через війну в Україні. Товариство надає фінансову допомогу семінаріям в Україні та стипендії (через Семінарський Стипендіальний Фонд імені о. В. Левицького) для студентів богослів’я, що навчаються за кордоном та у Свято-Софіївській семінарії. Товариство займається виданням релігійної літератури, допомогає в медицині та церковних реставраціях. Товариство підтримує християнське духовне відродження Українського народу, зусиллями Української Православної Церкви відновлює універсальні принципи гуманності, справедливості, милосердя та толерантності, а також повного відродження переслідуваної та розгромленої Церкви в колишньому Радянському Союзі. З часу свого заснування Товариство отримало пожертв понад 1,3 мільйона доларів на свої релігійні, освітні та гуманітарні проекти. У листопаді 1994 р. Вселенський Патріарх Варфоломій I запросив митрополита Костантина та архієпископа Антонія відвідати Патріархію та поговорити про відновлення стосунків, які існують більш ніж тисячу років з Патріархією, звідки Україна прийняла Християнство в 988 р.. Митрополит та Архієпископ були призначені митрополитом Мстиславом, представляти нашу Церкву на похороні Вселенського Патріарха Димитрія. Архієпископ Антоній був призначений представляти Церкву на Інтронізації Патріарха Варфоломія. Попередньо, Архієпископ Антоній супроводжував Патріарха Мстислава під час його зустрічі з Патріарха Варфоломія на початку 1991 року, коли Патріарх Мстислав закликав Вселенського Патріарха працювати над визнанням канонічності відродженої Церкви в незалежній Україні. Після цих обговорень у лютому 1995 р.Раді Митрополії нашої Церкви був представлений ряд домовленостей, які Церковний Собор схвалилив у жовтні цього ж року, з усього лише 17 голосами проти. Ці переговори привели до визнання Української Православної Церкви США як юрисдикції під омофором Вселенського Патріарха, повернувши таким чином Українську Православну Церкву на своє законне місце у світовому Православ’ї. Наша Церква зберегла свою структуру та адміністративну незалежність в керівництві, що залишається незмінним вже протягом 23 років. Раптом наш голос був почутий у Православному світі, включно з Україною. Протягом цих 23 років, наші ієрархи на прохання Патріарха представляти Його в багатьох історичних подіях життя Української нації та її Церкви. У 1996 р. архієпископ Антоній та єпископ Всеволод Української Православної Церкви в Америці провели переговори про остаточне та довгоочікуване об’єднання двох Українських Православних юрисдикцій у США – УПЦ в Америці та УПЦ США в нашу Українську Православну Церкву США (УПЦ США). Регулярний Собор Церкви в 1995 р. затвердив рішення про таке об’єднання. В перший тиждень листопада 1996 р. Українська Православна Церква в Америці провела в приміщені нашої Бібліотеки Надзвичайний Собор. В кінці Собору, митрополит Константин отримав добру новину та доручив оголосити її під час Божественної Літургії в Церкві-Пам’ятнику Святого Андрія у найближчу неділю. Єпископ Всеволод був підвищеений до сану архієпископа та став правлячим архієреєм Західної Єпархії з Катедрою Св. Володимира у м. Чикаго. Митрополит Константин очолив Центральну Єпархію з Катедрою Св. Володимира в м. Парма, штат Огайо, а архієпископ Антоній очолив Східну Єпархію з Катедрою Св. Володимира в м. Нью-Йорк. Єпископ Всеволод був сином священика, який протягом 20 років працював сімейним терапевтом. Він закінчив богословську освіту в Варшавській Православній Семінарії та Диллінденську Богословську Школу в Німеччині. Він працював з митрополитом Андрієм Кущаком, який висвятив його на священика. Єпископ Всеволод очолював Українську Православну Церкву в Америці у 1987-1996 рр., перебравши керівництво від Високопреосвященніного Митрополита Андрія Кущака, який помер у 1986 році. Це була єпархія єпископа Богдана (Шпильки) під юрисдикцією Константинопольського Патріархату. З моменту його інтронізації на Первоієрарха, єпископ Всеволод був задіяний в екуменічних відносинах. Він був призначений до Православного-Католицького Діалогу, і представляв Патріарха в багатьох делегаціях на академічних та пасторських конференціях та мав добрі відносини з ієрархами всіх конфесій. Він завжди підтримував Вселенський Патріархат, багато разів представляючи Патріарха в Україні, зустрічаючись з різними церковними діячами та прагнучи до єдності Церкви, сміливо проголошуючи, що Вселенський Патріархія ніколи не відмовилася від своїх обов’язків як Матері Церкви для України і ніколи не схвалила передання Української Православної Митрополії Російській Православній Церкві канонічним поступком. Після об’єднання його юрисдикції з нашою Церквою та його піднесенням до архієпископа починаючи з 1996 року владика Всеволод продовжував представляти нашу Церкву на багатьох екуменічних зібраннях та конференціях, зокрема на щорічній конференції “Orientale Lumen” у Вашингтоні, округ Колумбія, яка збирала представників Церков з усього світу. Він активно працював з молоддю нашої Церкви. Особливо, він любив Молодіжну Українську Православну Лігу, де зустрічався з молоддю на щорічних з’їздах, менше відвідуючи конференції дорослої Ліги. Архієпископ помер 16 грудня 2007 року та похований на Свято-Андріївському цвинтарі. У 1997 році ми стали свідками освячення відновленого будинку родини Фішерів – старанно відремонтували який наші власні працівники - переробивши його в прекрасний історичний будинок. Оригінальна частина будинку була побудована в 1688 році, і тепер він є перлиною історичної спадщини округу Сомерсет, штат Нью-Джерсі. Щорічно сотні відвідувачів відвідують будинок, задумуючись про те, яким було життя власників цього будинку, котрі відіграли таку важливу роль в американській історії. На жаль, під час нещодавнього ремонту нового даху на будівлі було виявлено серйозні пошкодження дерев’яних стін термітами. Наразі розробляються архітектурні плани, щоб зробити необхідний ремонт, щоб зберегти цю історичну будівлю, як найстарішу резиденцію в окрузі Сомерсет, штат Нью-Джерсі. Велике благословення було послане Церкві на початку цього Тисячоліття, у 2000 році, з прийняттям у нашу Церкву Диякона Володимира Зелінського. Диякон народився і виріс на Україні, був охрещений таємно у будинку місцевого Православного священика в Івано-Франківську. Він розпочав своє богословське навчання в Україні і закінчив його у Свято-Софіївській Семінарії. Він був висвячений на священика в травні 2001 року, і незабаром після цього прийняв монаший постриг в монастирі Покрови Пресвятої Богородиці, м. Довер, штат Флорида, з іменем Даниїл. Отець Даниїл був призначений на парафію Вознесіння Христового, у м. Кліфтон, штат Нью-Джерсі. Після розробки Архієпископом Антонієм програми Адаптації дитячих будинків-сиротинців на Україні, отець Даниїл у 2004 р. був призначений Духовним Опікуном програми.Церква швидко розширила свою програму з одного до відразу трьох сиротинців. Під керівництвом о. Даниїла, студентські місійні групи почали відправлятися на Україну кожного літа, а зимою на Свято Миколая дорослі любого віку кожного року почали відвідують дитячі будинки, де вони допомагали з ремонтом, а найголовніше приносили радість і любов у життя найбільш немічних, як фізично, так і розумово дітей-сиріт. Під час регулярного Церковного Собору у 2007 році митрополит Константин від імені Собору Єпископів запропонував кандидатуру ієромонаха Даниїла на єпископа. Собор відповів одностайним схваленням. У травні 2008 р. архімандрит Даниїл був рукоположений в єпископа у Катедрі Св. Володимира, м. Парма, штат Огайо. Він замінив архієпископа Всеволода ставши єпископом Західної Єпархії з Катедрою у м. Чикаго. У 2010 р. єпископ Даниїл був відкликаний до Центру Митрополії, щоб взяти на себе обов’язки Декана Свято-Софіївській Семінарії проте продовжуючи виконувати всі обов’язки, як єпископ Західної Єпархії. Важливою частиною його праці в Семінарії було дістати від Еміграційного Департаменту США (SEVIS) дозвіл приймати на навчання іноземних студентів. Досягнувши цієї мети, єпископ Даниїл разом з о. Василем Завірюхою, Провостом Семінарії, розробив програму залучення студентів з України. Він також багато допоміг о. Ф. Реллі з успішною заявою семінарії до Відділу Освіти штату Нью-Джерзі, для отримання ліцензійного статусу навчального закладу. Після затвердження цього статусу, Семінарії було надано право нагороджувати студентів дипломом Магістра Богослів’я. На даний час, як Провост Семінарії, владика готує звернення до Американської Асоціації Духовних Шкіл для надання акредитації нашому навчальному закладу. Це багаторічний процес, який вимагатиме значних зусиль і потребує подолання багатьох викликів. Під час надзвичайного Собору у 2012 році, коли Архієпископ Антоній був обраний Митрополитом, єпископ Даниїл був піднесений до сану архієпископа та обраний Головою Консисторії. Архієпископ протягом десяти років побував в Україні багато разів, представляючи нашу Церкву, Вселенський Патріархат, вірних та сиріт. З 2016 р. Митрополит Антоній призначив Архієпископа Даниїла опікуватися Українськими Православними Вірними в Західної Європі, включно з Великобританію. Освячення Мавзолею Святого Воскресіння відбулося 7 травня 2001 року у неділю Св. Фоми – Провідну Неділю, що стало завершенням однієї з мрій Патріарха Мстислава, який від самого початку будував Церкву-Пам’ятник з мавзолеєм внизу. Зараз, там знаходиться крипта Патріарха, яка була освячена 11 червня 1994 року, рік після його смерті, разом з невеликим музеєм про його діяльність. Навколо крипти знаходяться ще 276 крипт для поховань Українців-Американців, які були активними у церковному та громадському житті. 14 жовтня 2001 року ми освятили місце для майбутнього Історичного Освітнього Музею в пам’ять Патріарха Мстислава, що доповнить будівництво Консисторійного/Бібліотечного Комплексу. На подвір’ї цього комплексу постане пам’ятник 8 мільйонам жертв Голодомору. Будівництво нового Музею почалося кілька років після освячення, через надзвичайно тривалий процес проектування та ухвалень місцевими органами влади. Це будівництво продовжується і сьогодні. Рішенням Церковних Соборів було те, що для будівництва музею не будуть залучені жодні Церковні кошти. Після кризи 2008 р. пожертви суттєво скоротилися і лише нещодавно почали знову зростати. Цей проект став довготривалим, для завершення якого нам необхідно зібрати величезні кошти. Ми закликаємо Вас підтримати цей важливий для майбутнього проект. Тисячі тисяч Українських Американців, Українські світові лідери, Американські Президенти, Сенатори, Конгресмени та Президенти України, а також багато інших українських урядовців та людей з різних конфесій відвідали наш Центр Митрополії/Духовний Осередок освячений 66 років тому. Вони побачили будівлі та установи побудовані тут з Милості Божої та за допомогою натхненних митрополита Іоана, Патріарха Мстислава та всіх єпископів і провідного духовенства нашої Церкви. На цій святій землі буде ще багато досягнуто теперішніми та майбутніми поколіннями єпископів, священиків та вірних, тому що Бог вселив в нас любов до Святої Української Православної Церкви та бажання передати нашу багату духовну і культурну спадщину, неушкодженою, нашим дітям та онукам. Нехай Бог укріпляє нас силою, присвятою та бажанням зробити це. (Замітка від автора: Я хочу щоб Ви розуміли, що те, що Ви читаєте тут, не є історія написана в академічному стилі. Тут Ви знайдете факти та епізоди з життя Української Православної Церкви США. Історія Церкви була б значно більшою з хронологічним порядком періодів життя Церкви та ознайомленням не лише з певними організаціями, ієрархами та конкретними подіями, пов’язаними з Осередком Митрополії. В історії потрібно було б згадати сотні мирян, духовенство та інших ієрархів. Одного дня справжня історія буде написана, але тим часом я сподіваюсь, що Ви з насолодою прочитали цей нарис).